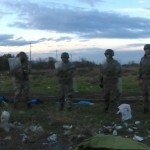 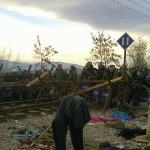 14.15: Macedonian soldiers on the border line. 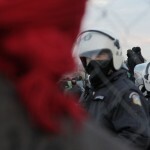 14.05: Greek police acted absolutely passive during the riot. 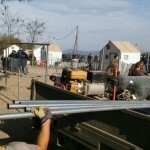 In the background of this photo you can see the new fence under construction. 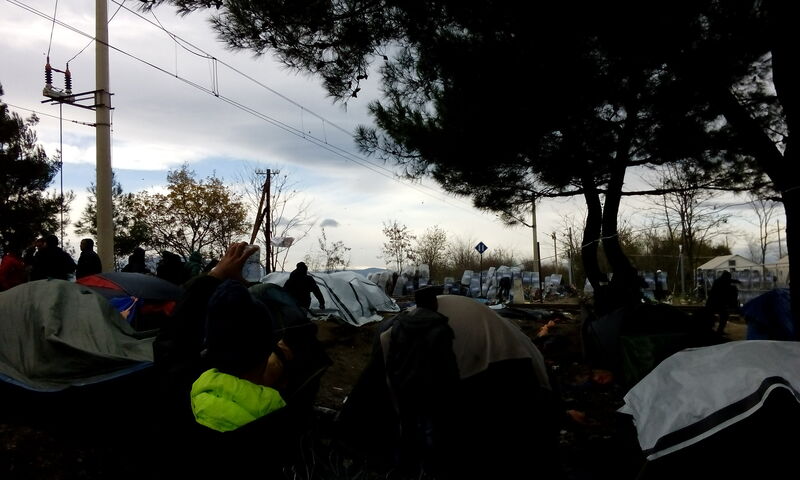 13.45: Situation calmed down for the moment. 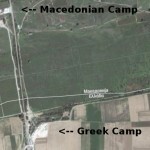 During the riot, Macedonian army entered Greek territory and destroyed the first lines of tents. 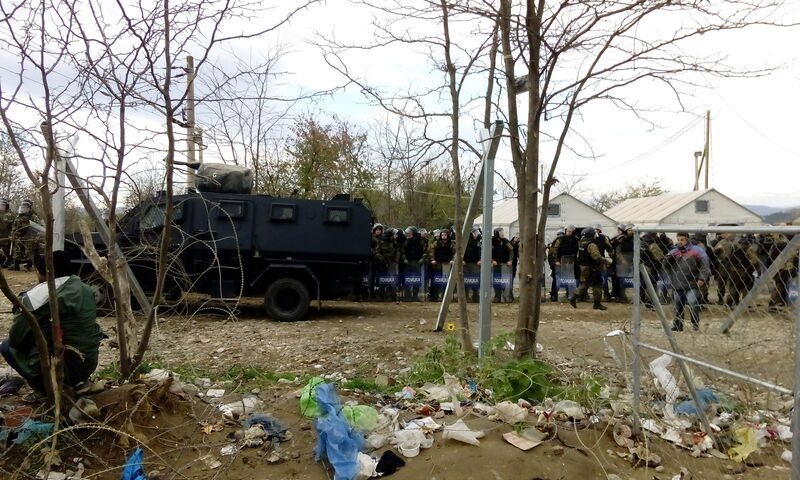 13.15: A lot of injured people because Macedonian army/police was throwing back stones and shooting with different kind of grenades into the crowd. 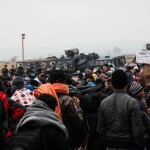 Massive use of tear-gas. 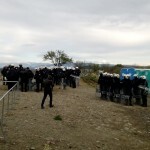 13.05: Heavy riot continues. 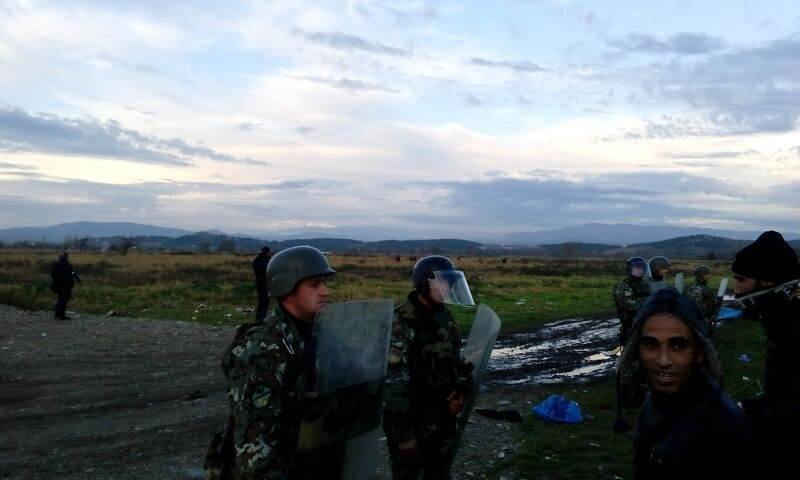 Macedonian army/police is throwing back stones and shooting with gas/smoke grenades into the camp. 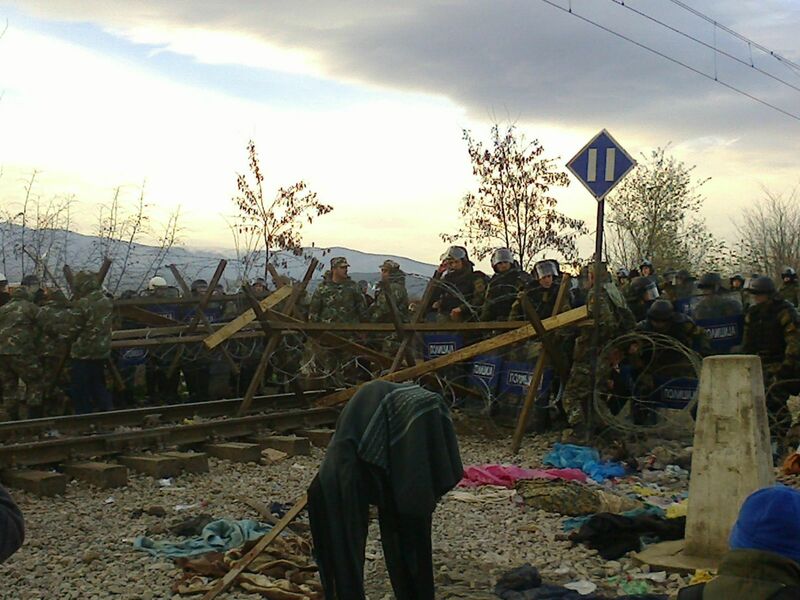 12.55: People started throwing stones on Macedonian police/army. 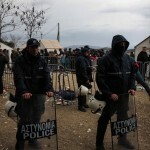 Greek police doesn’t intervene. 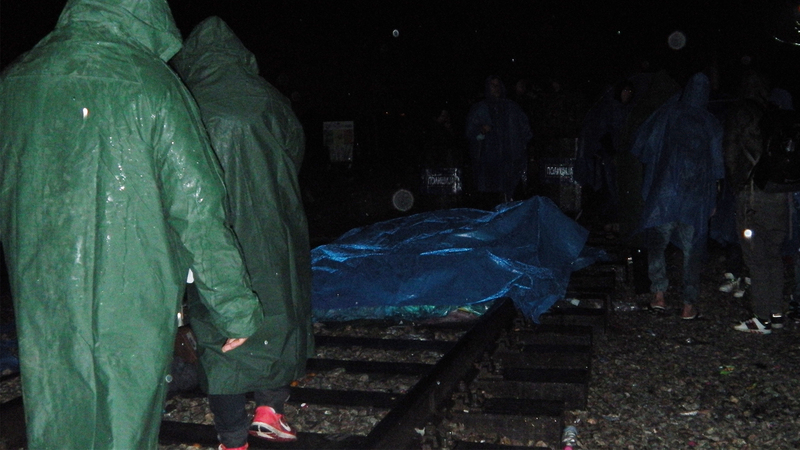 19.00: It stopped to rain. 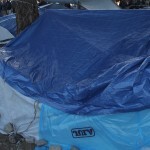 But it is very, very cold now. 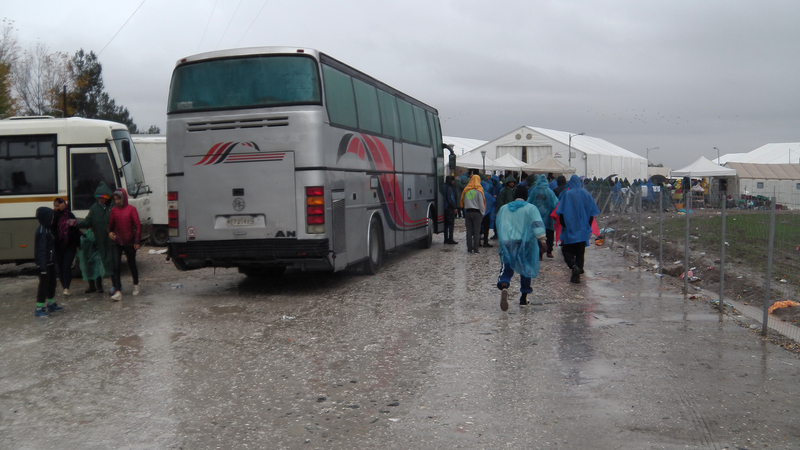 Still people are arriving with buses, including those, who are not allowed to cross the border. 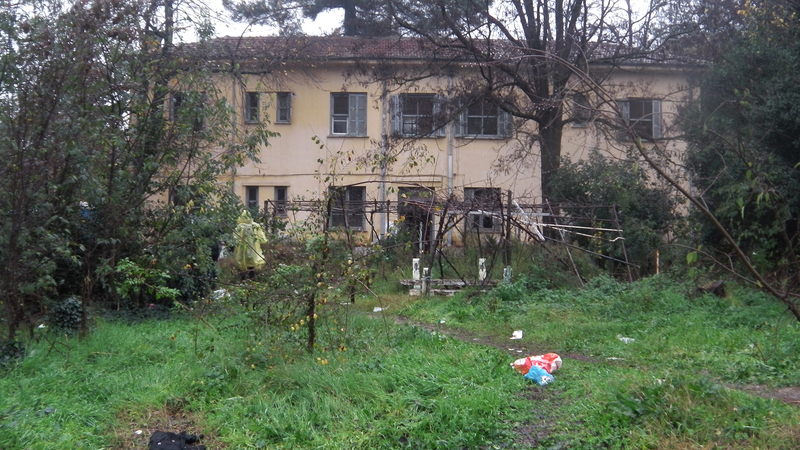 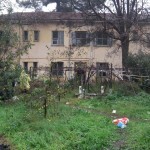 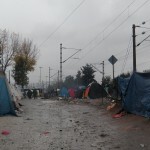 There is a lack of nearly everything: Blankets, hot drinks, clothes, etc. 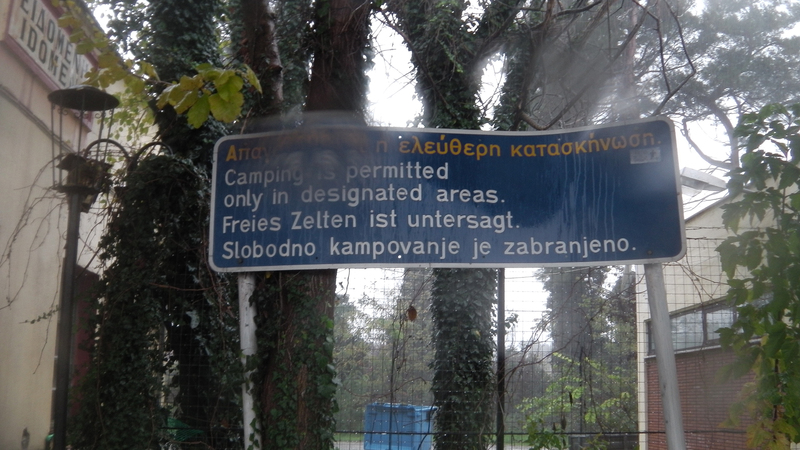 14.05: Heavy rain. 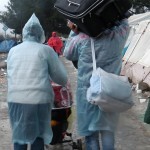 The situation is close to a catastrophe, a lot of people are totally soaked. 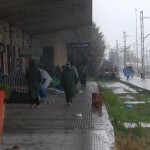 Many left to Athens with buses. 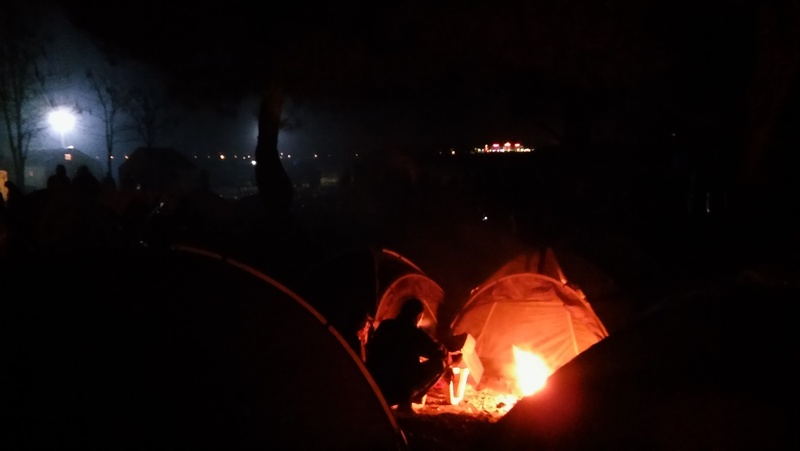 The tension in the camp of Eidomeni rises constantly, as more people arrive and perspectives of those already stuck for many days are desperate. 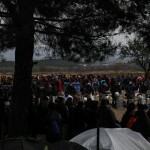 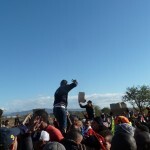 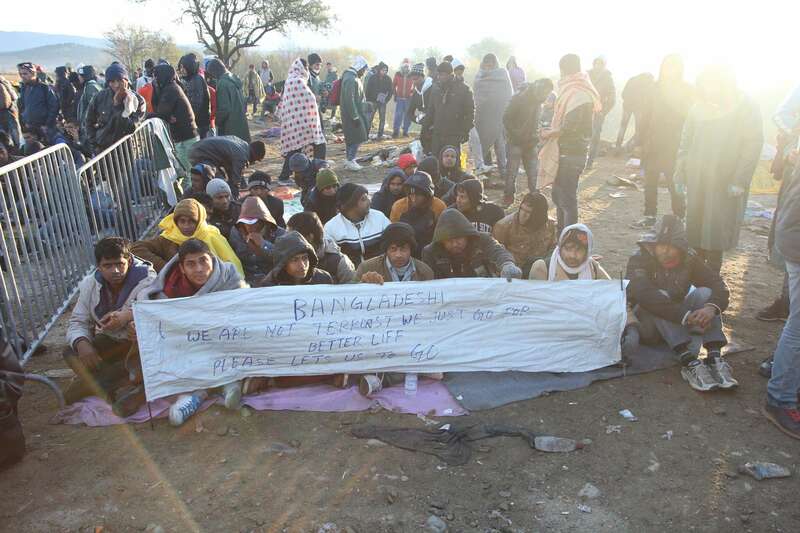 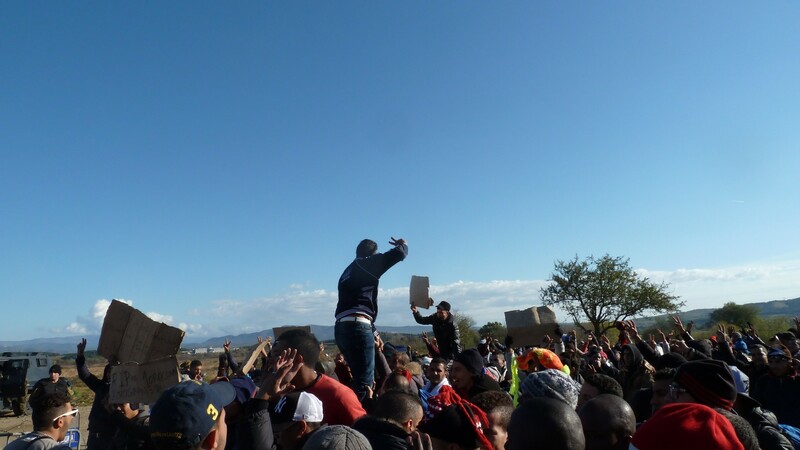 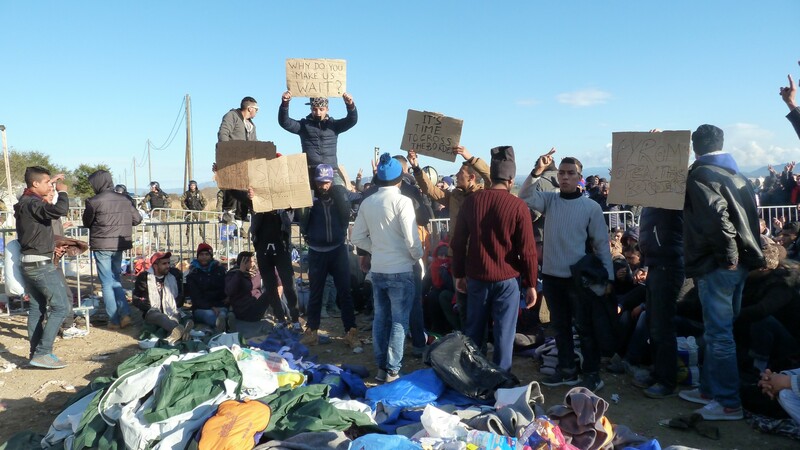 Yesterday, around 500 migrants protested intensively against their situation and tried to pass over. 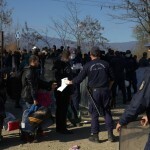 15 persons managed to cross the border. 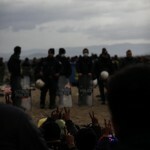 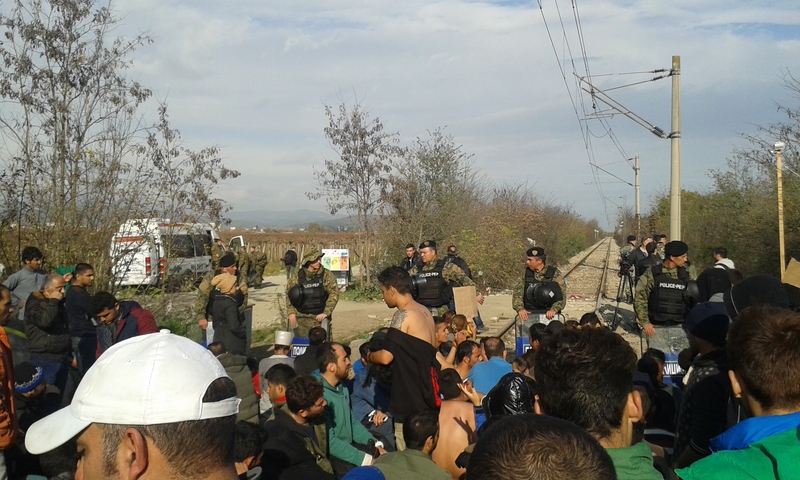 Macedonian police was massively present and used violence to prevent any border further crossings. 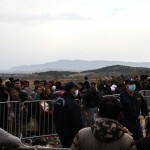 Those who passed were caught little later by Macedonian police and pushed back to Greek territory. 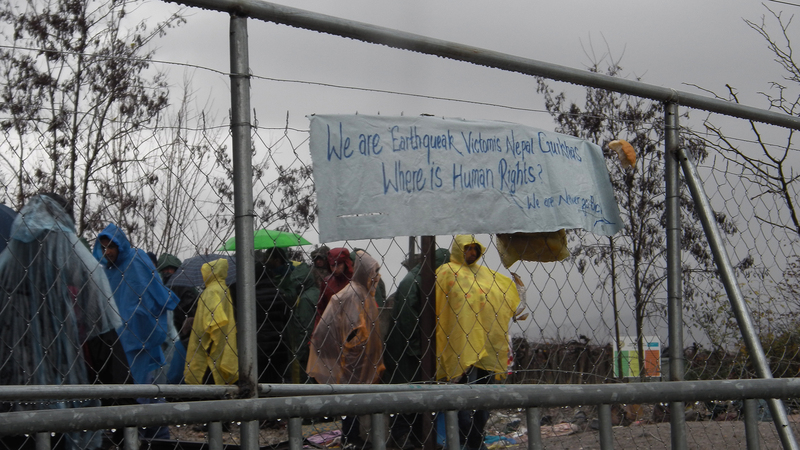 The protesters moved away a big part of the barbed wire on the border line. 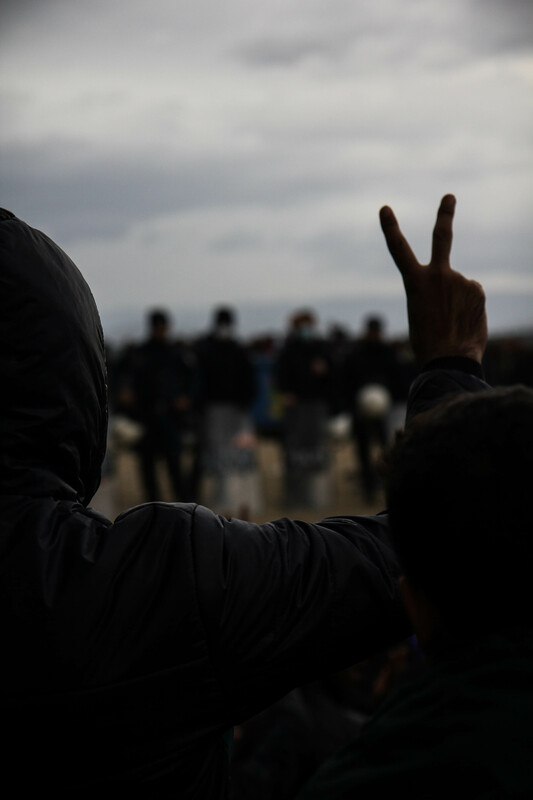 The next days will show, in which way authorities will react on this powerful signal of freedom of movement. 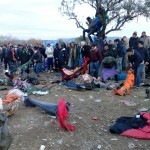 In the evening the situation calmed down, but many more people arrived. 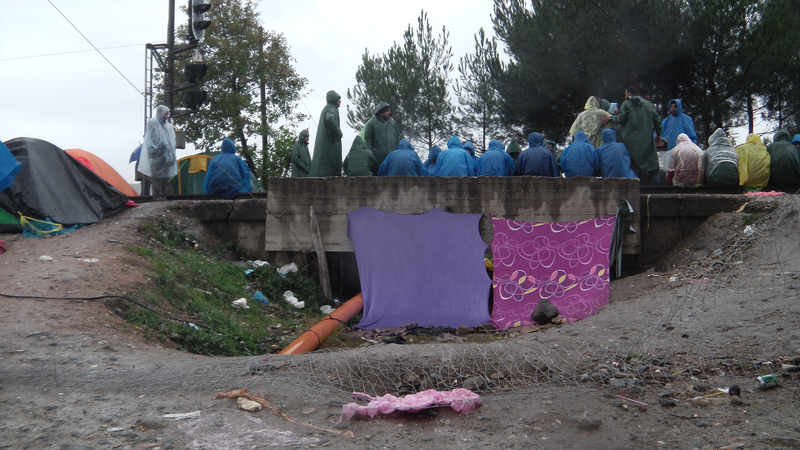 Even those, who are allowed to pass, have to wait now for some time. 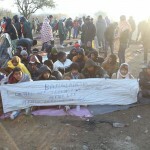 Those who are stuck do not have access to adequate accommodation and provision of goods as temperatures are decreasing. 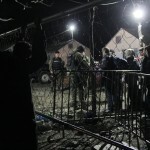 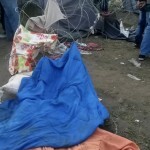 16.15: Protesters partly moved away the NATO barbed wire. 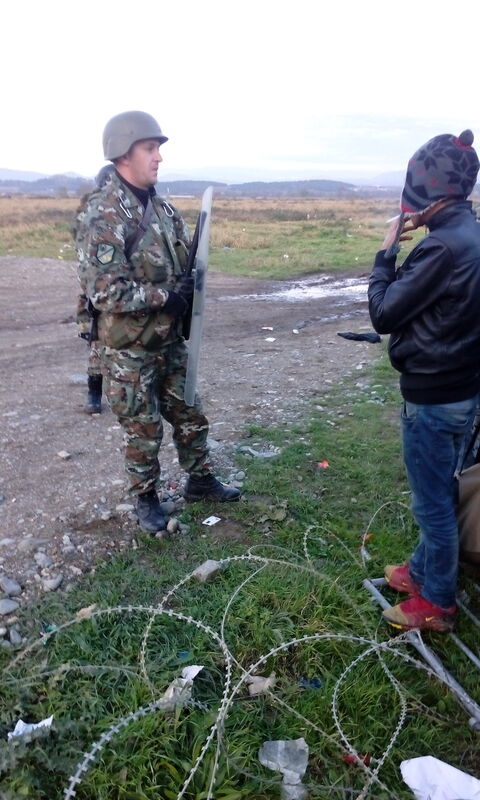 Now, Macedonian soldiers are blocking the border. 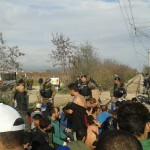 15.40: Approximately 15 people crossed the border in an irregular manner. 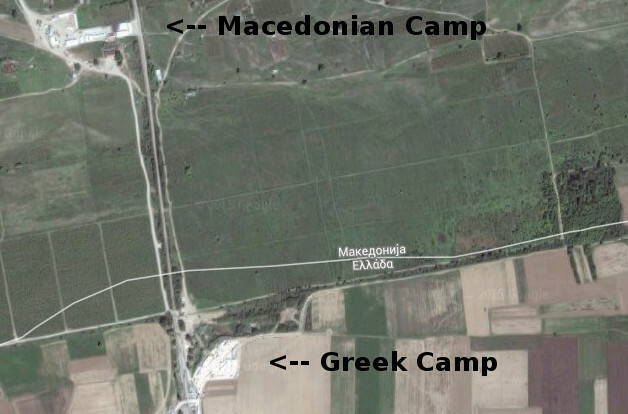 At the moment, they are caught and brought back to Greece by the Macedonian army. Fence construction continued today. 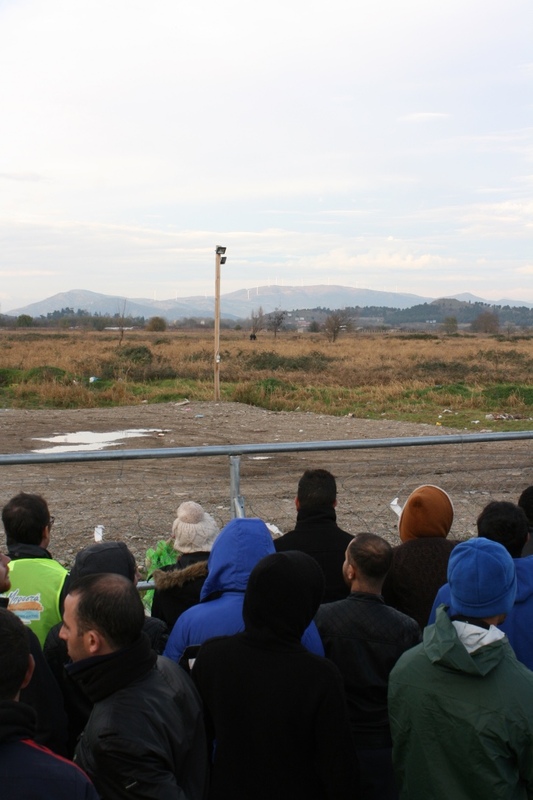 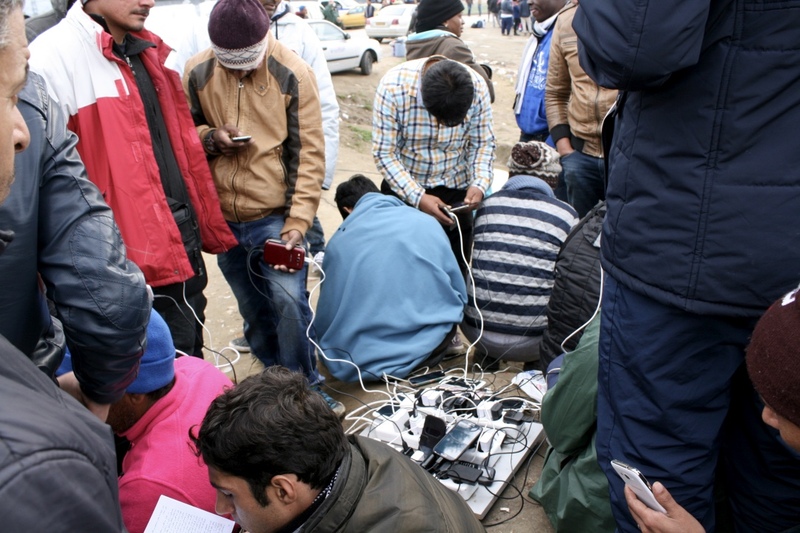 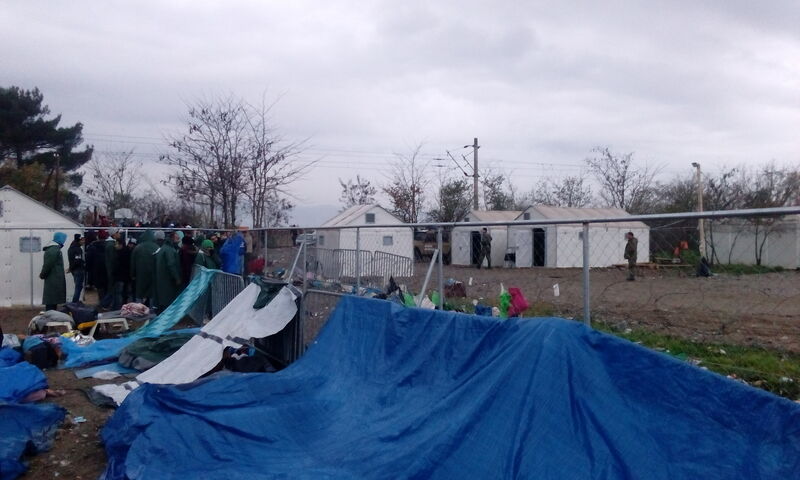 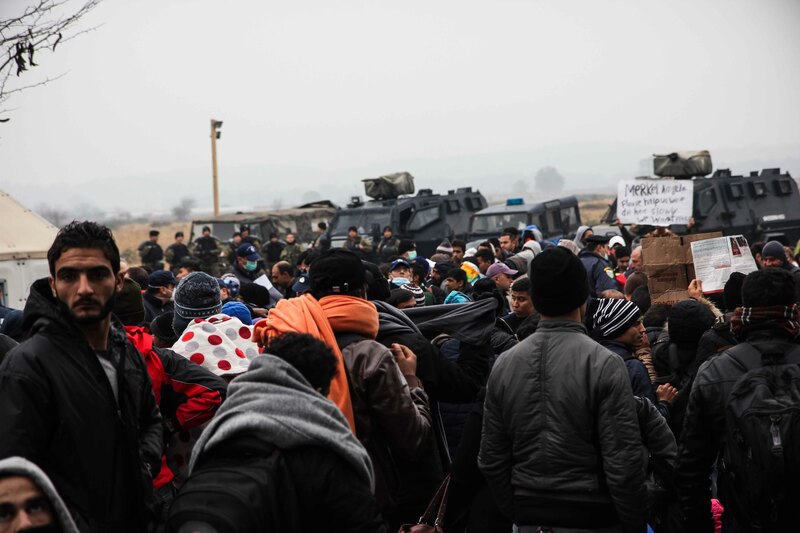 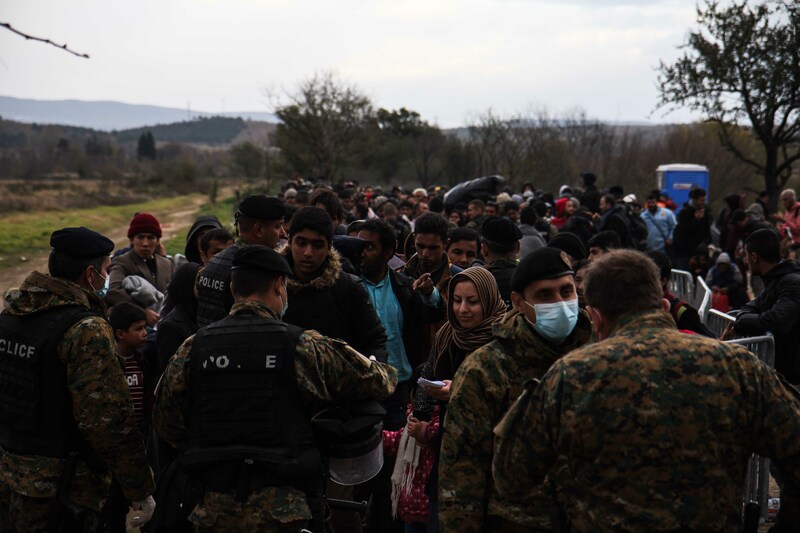 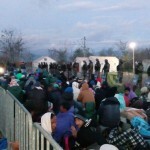 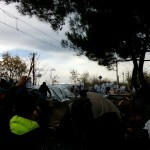 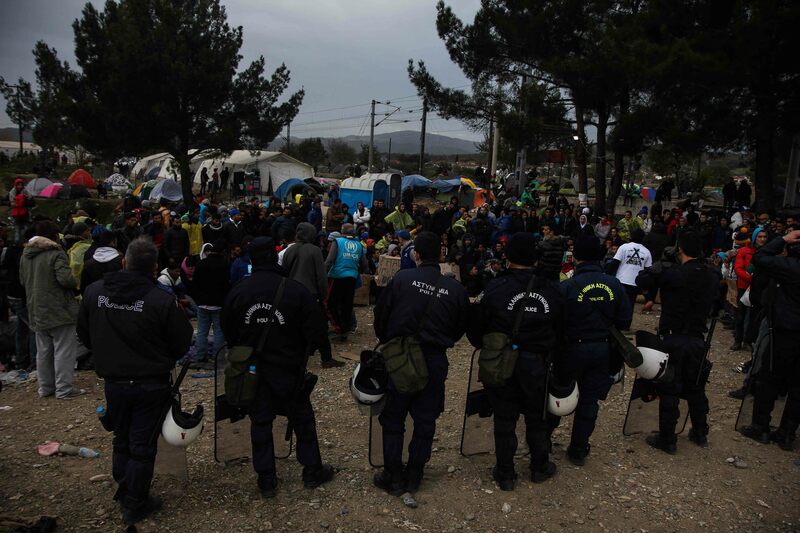 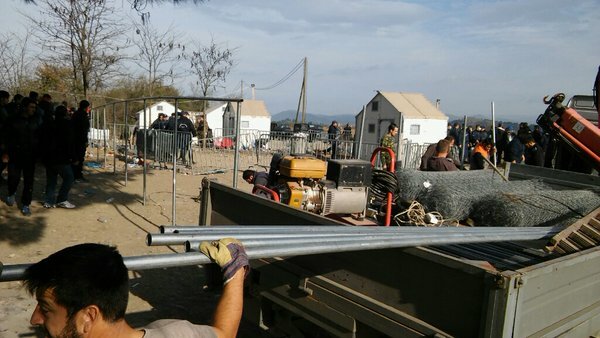 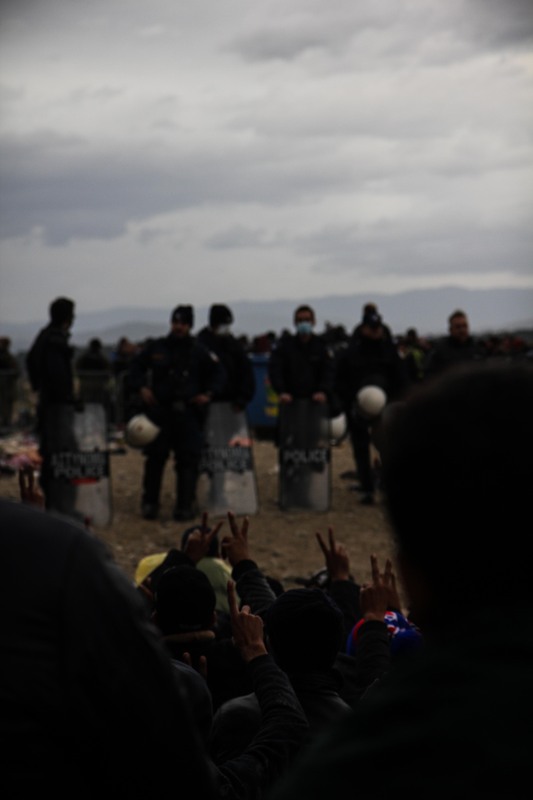 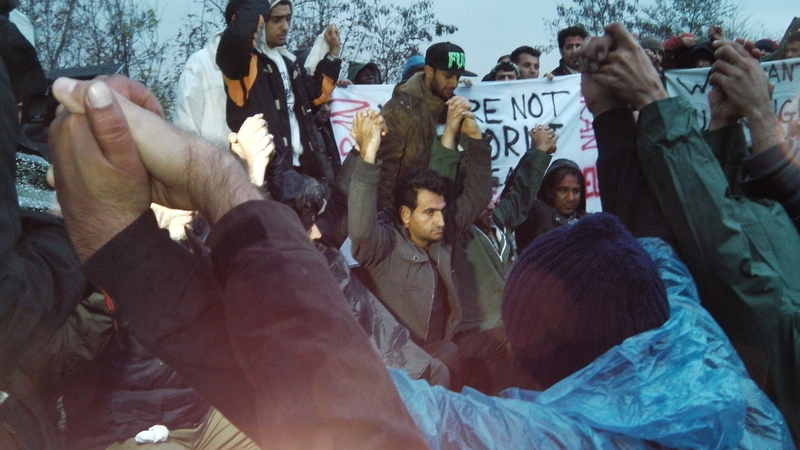 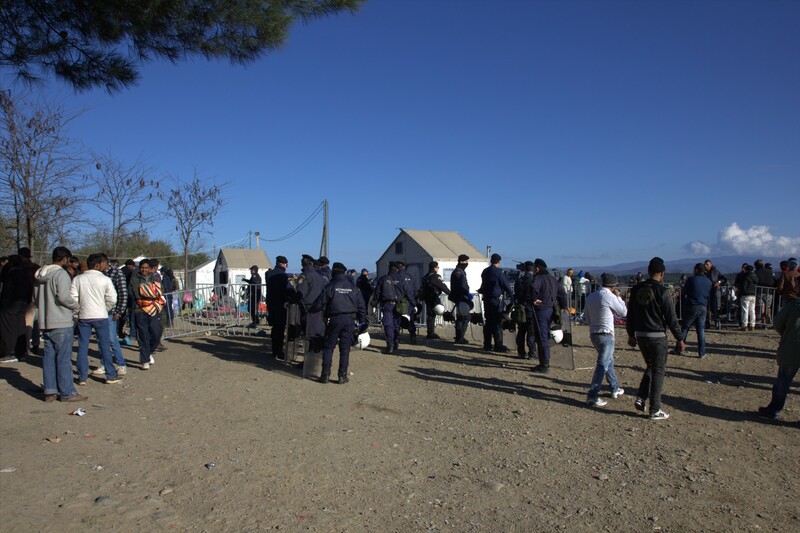 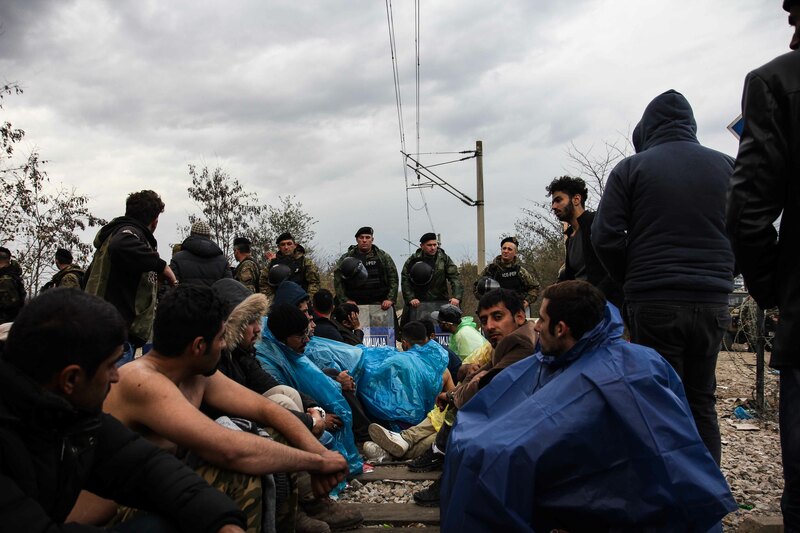 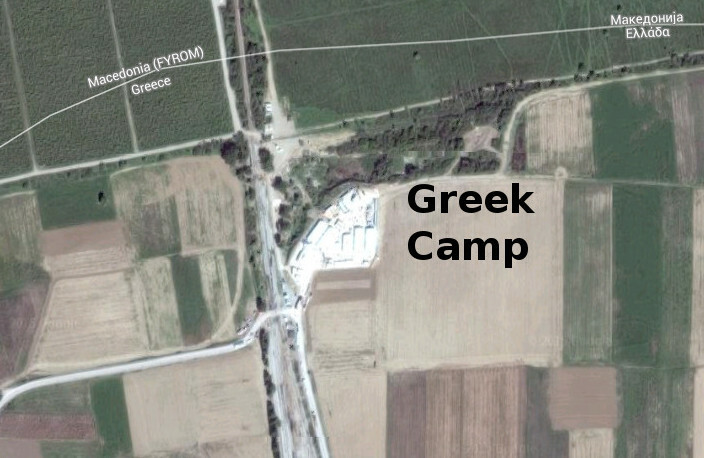 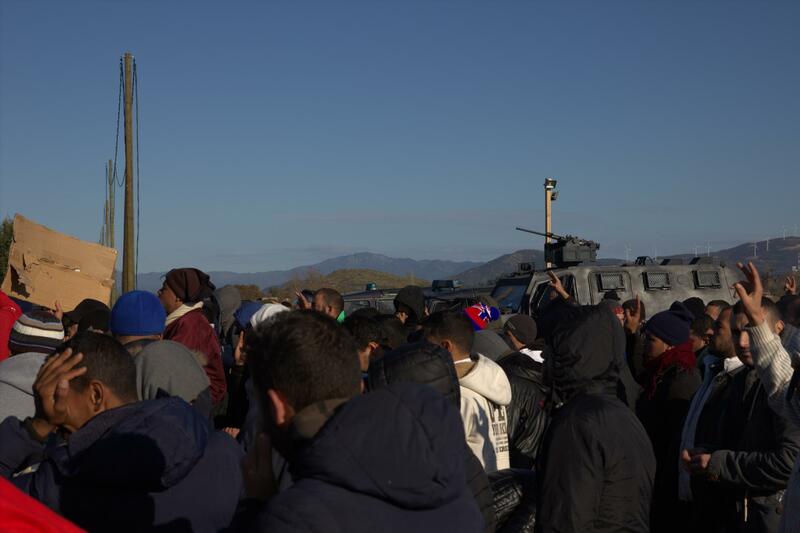 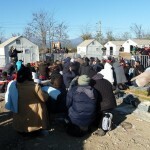 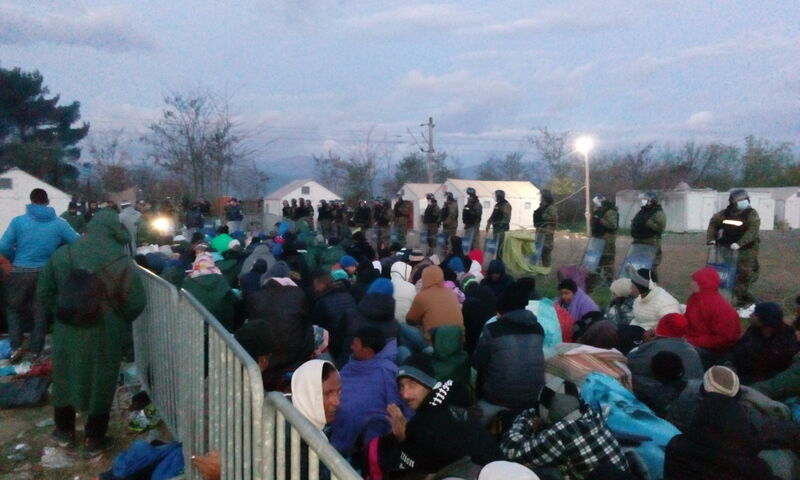 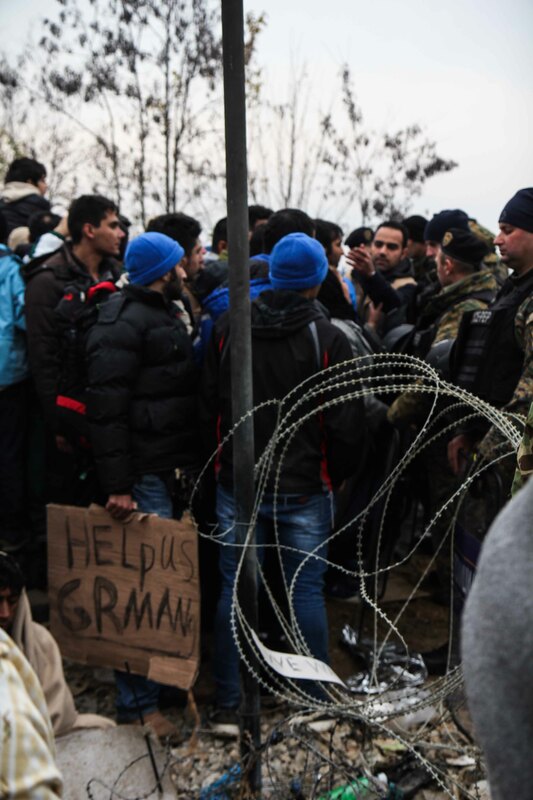 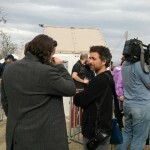 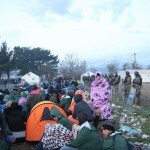 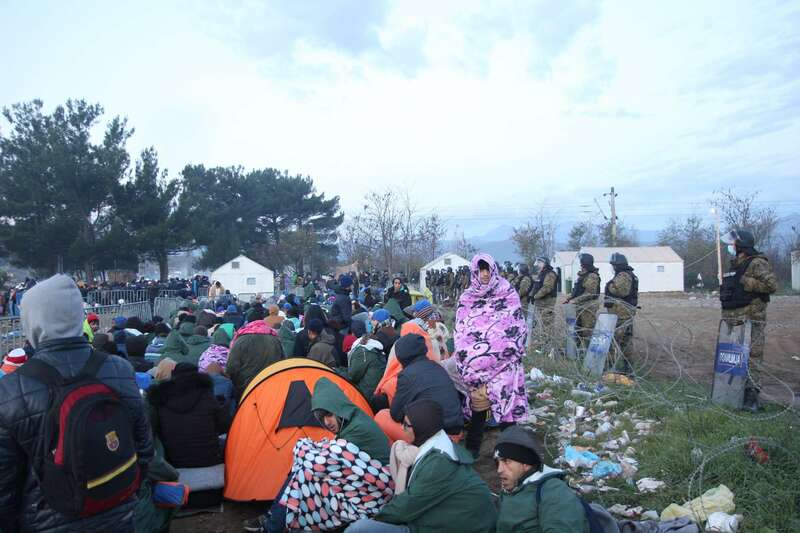 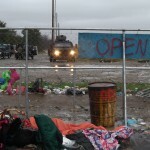 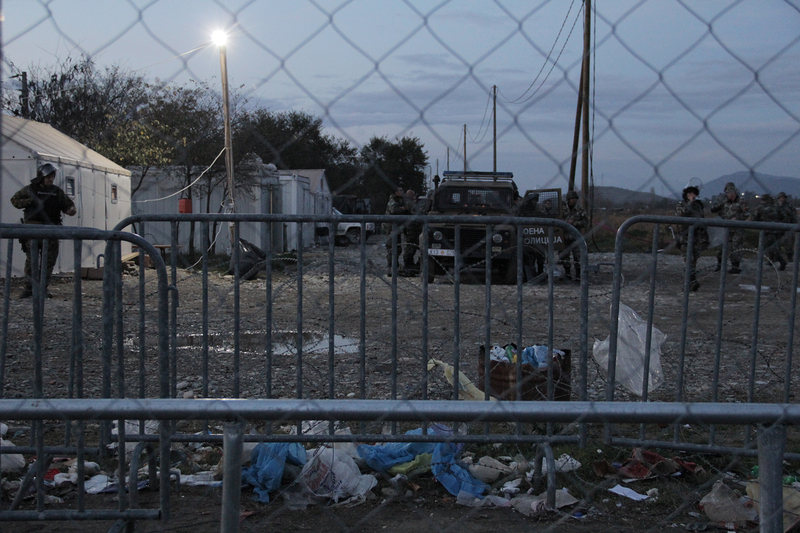 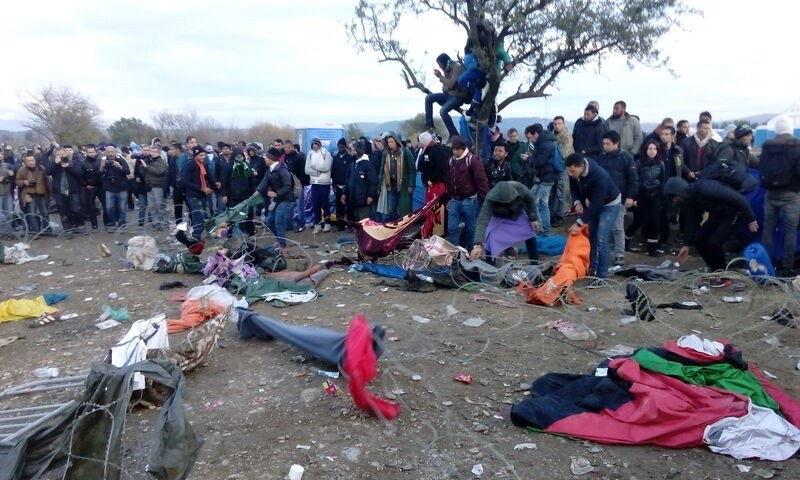 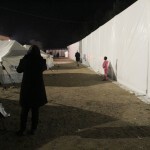 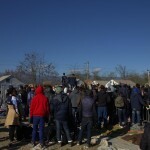 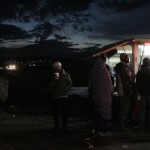 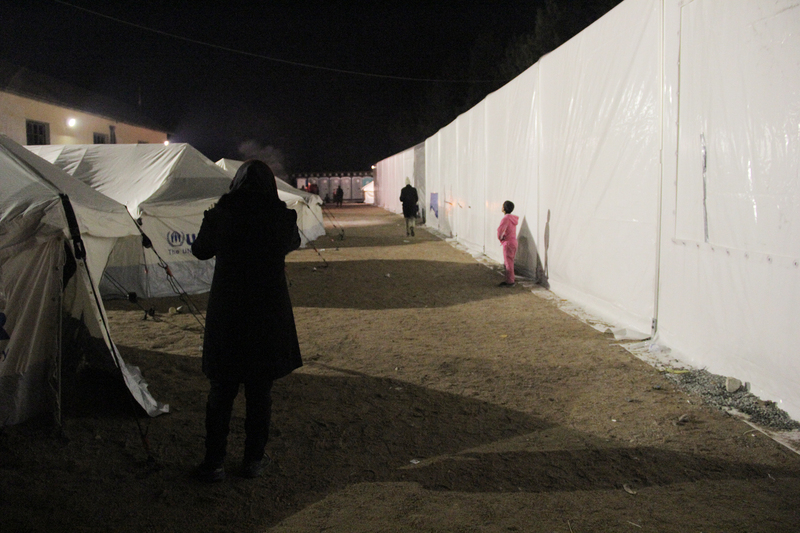 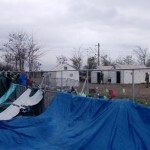 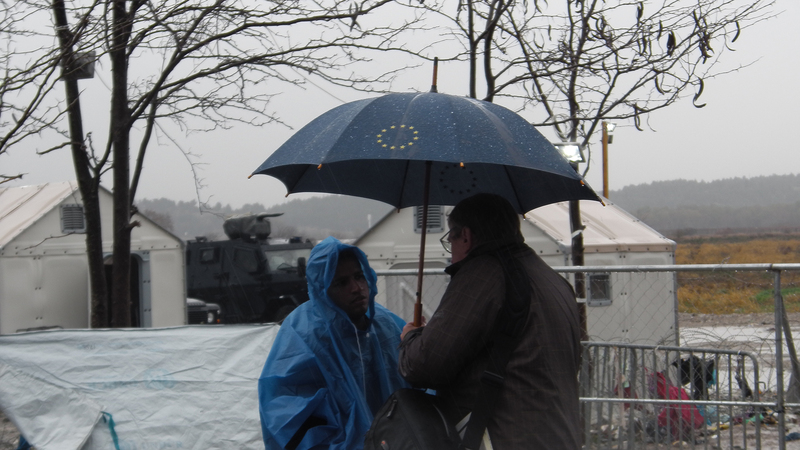 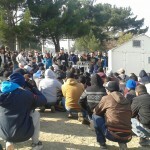 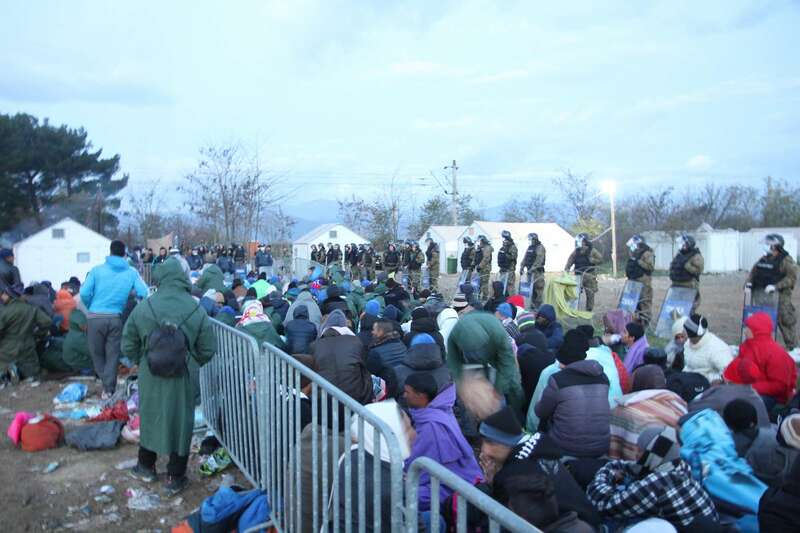 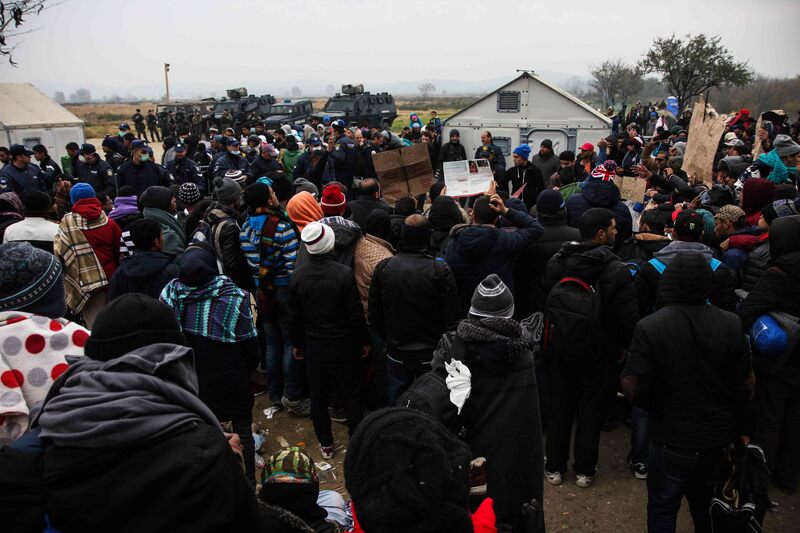 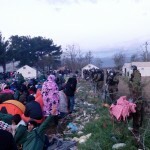 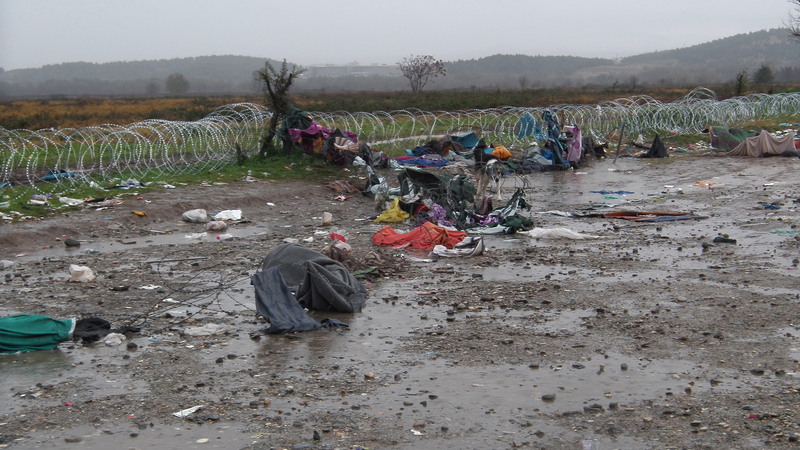 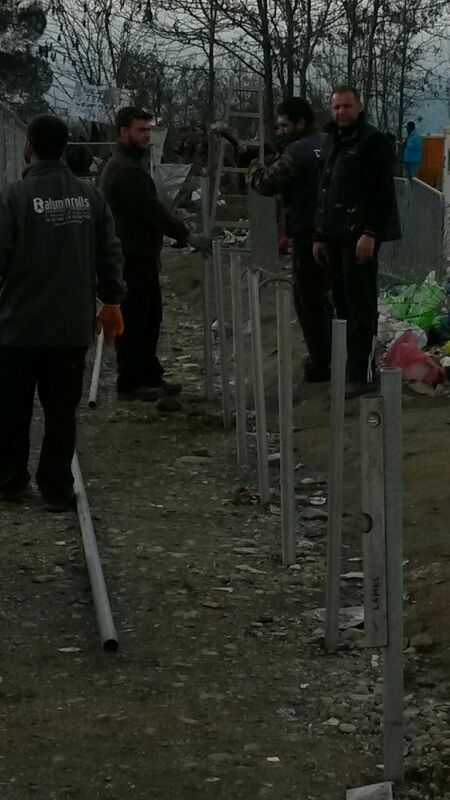 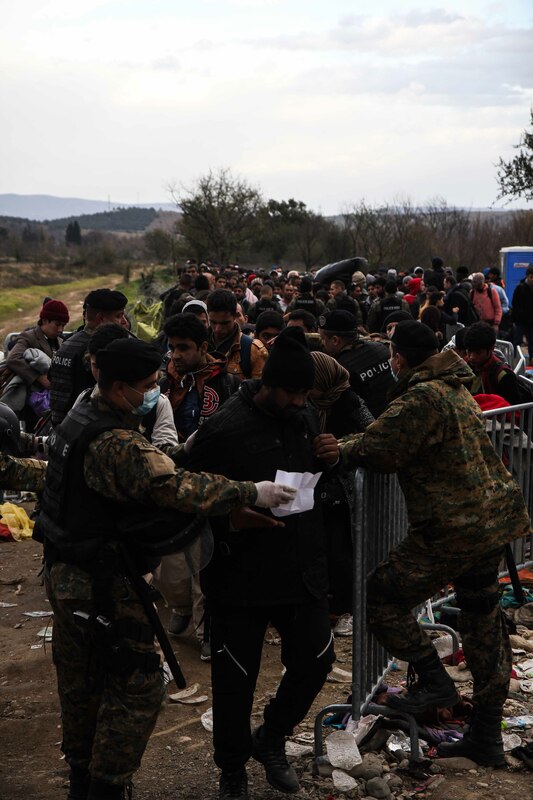 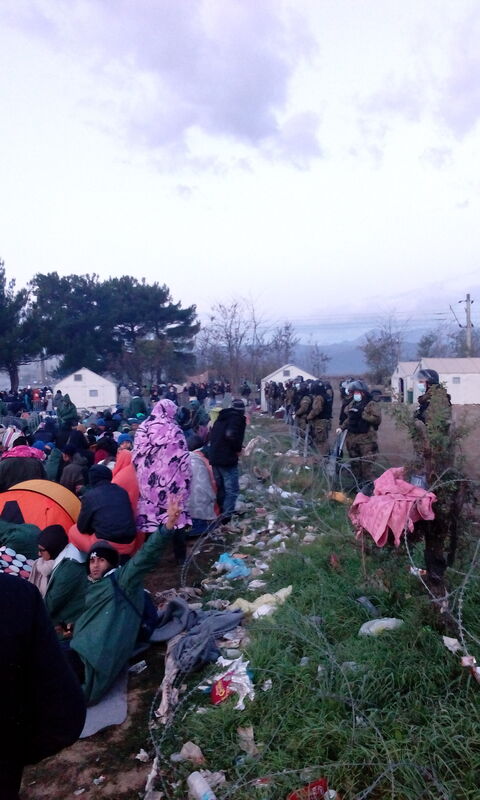 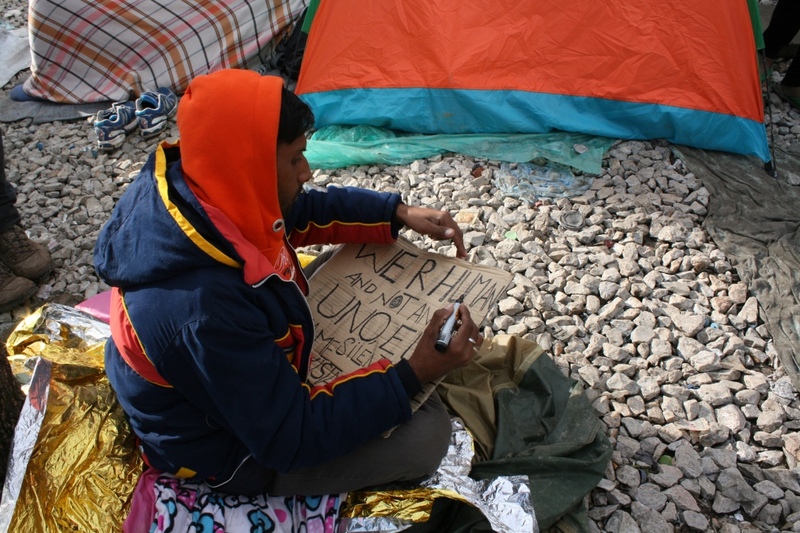 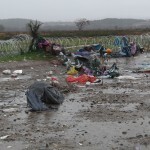 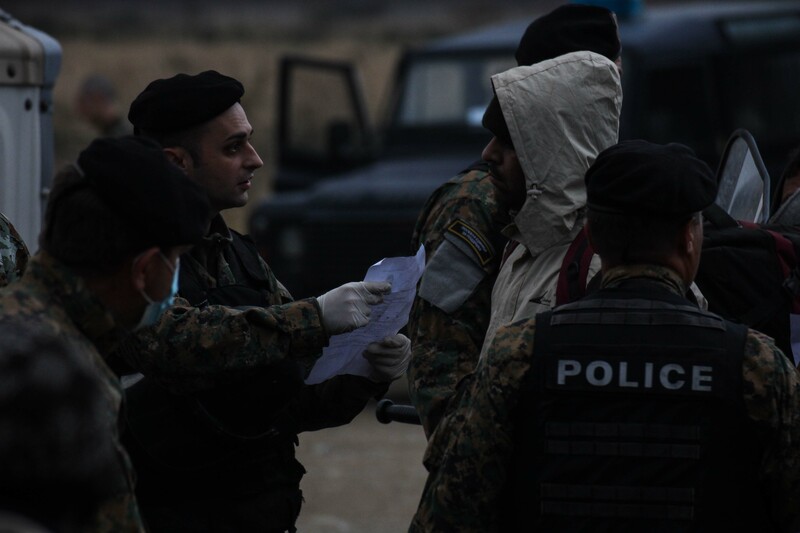 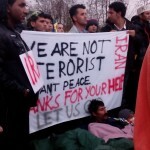 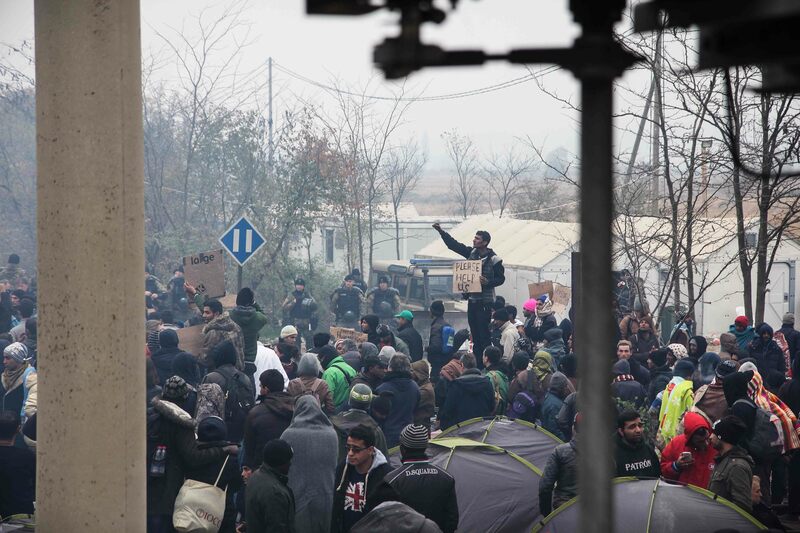 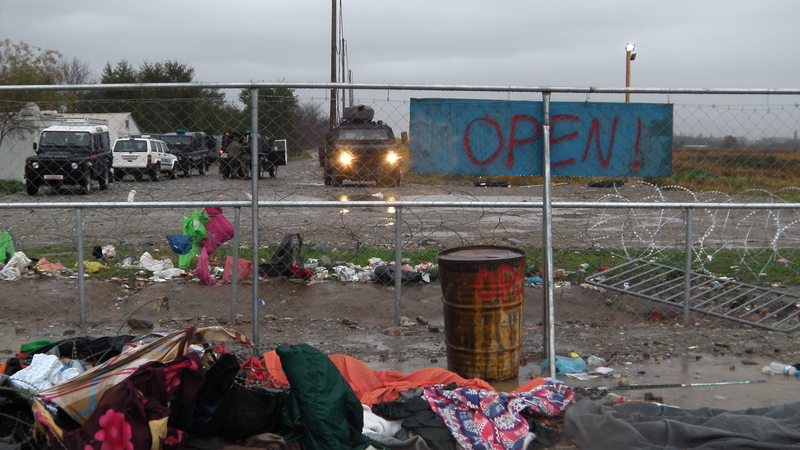 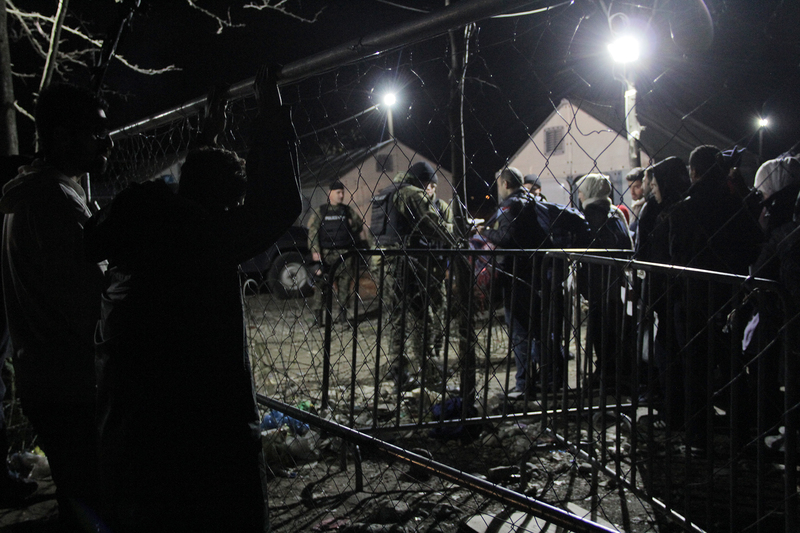 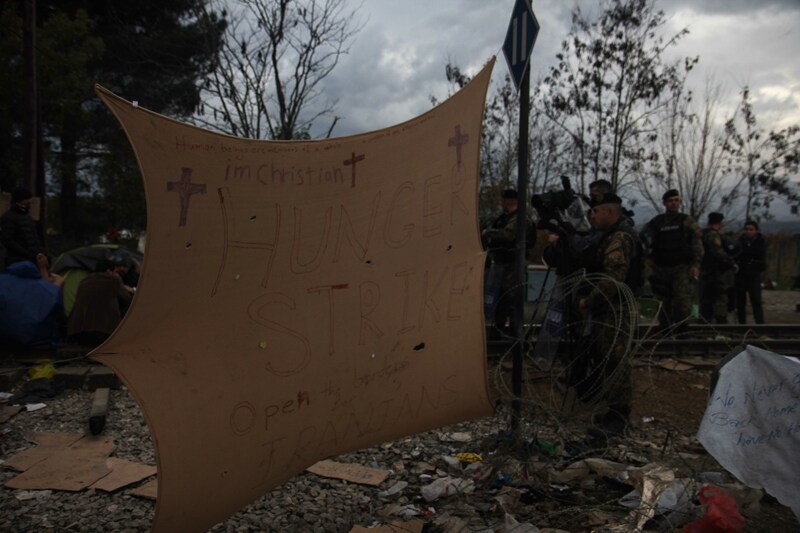 12.25: Ten Pakistanis were brought back to the camp in Eidomeni by the Macedonian army. 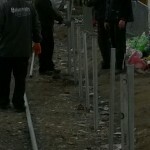 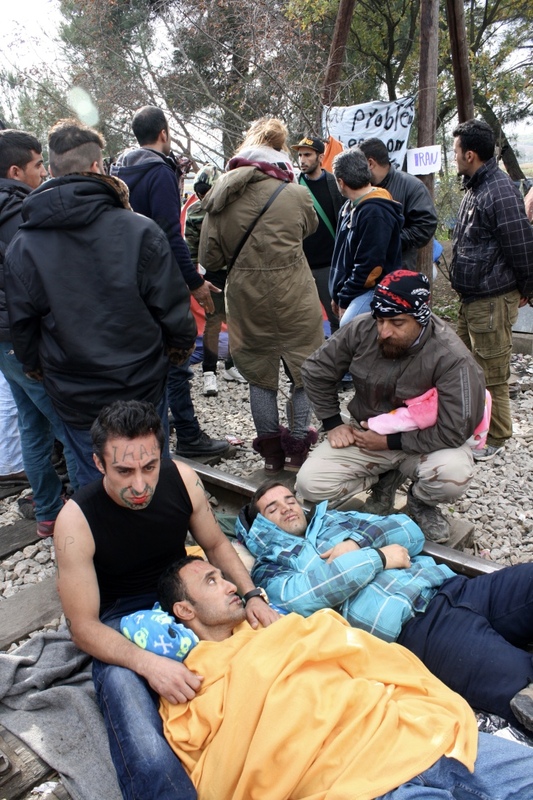 11.00: Hunger strikers slept without tents on the rail tracks. 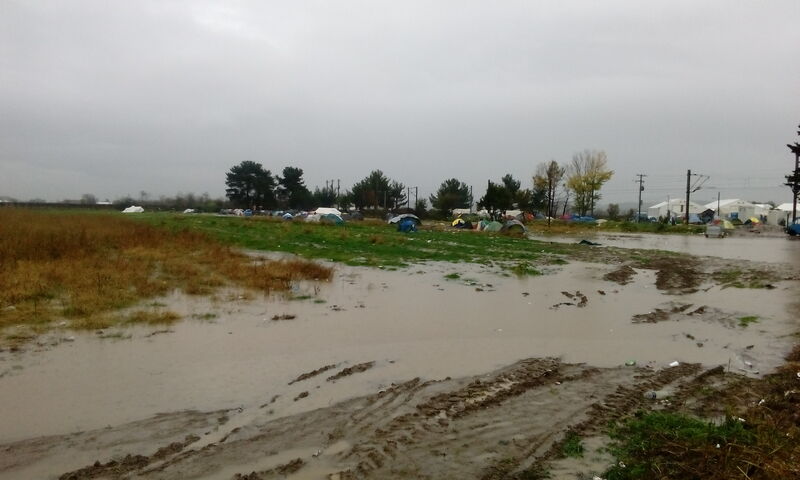 17.30: Heavy rain now. 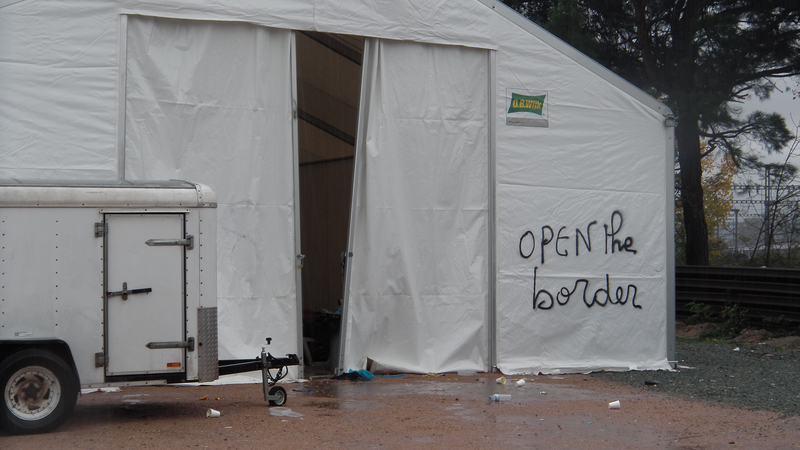 This is particularly hard for people who do not have a place in the official tents. 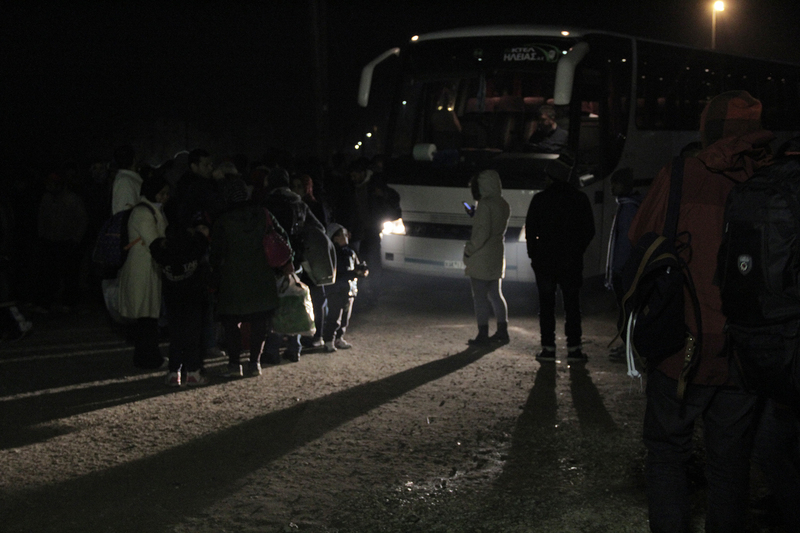 For buses with approximately 200 new people arrived. 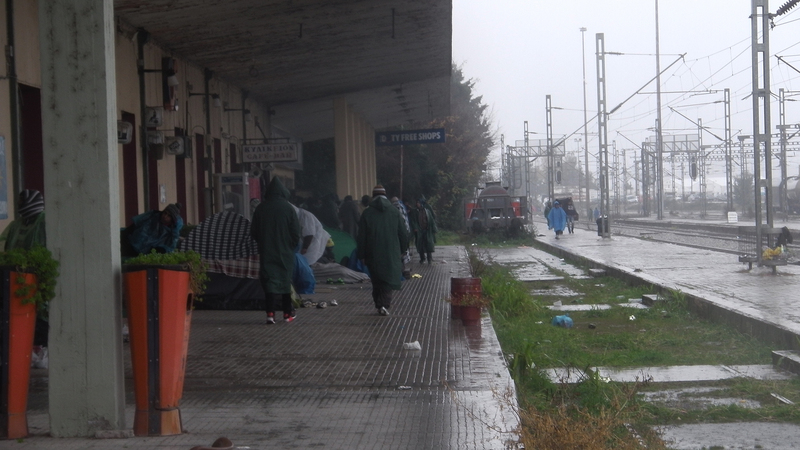 16.00: It started to rain today. 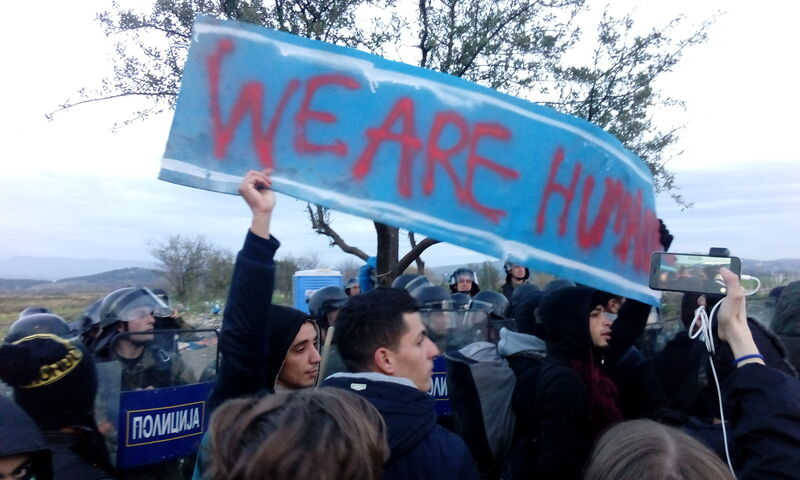 Protests are continuing. 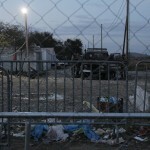 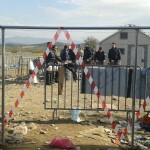 Greece extended the fence at the crossing point. 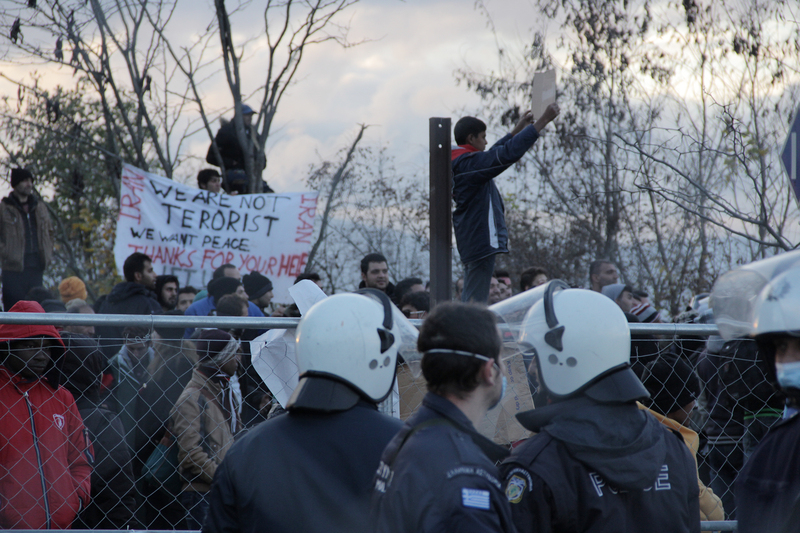 Call for local presence and transnational support! 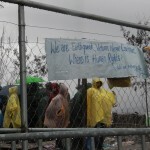 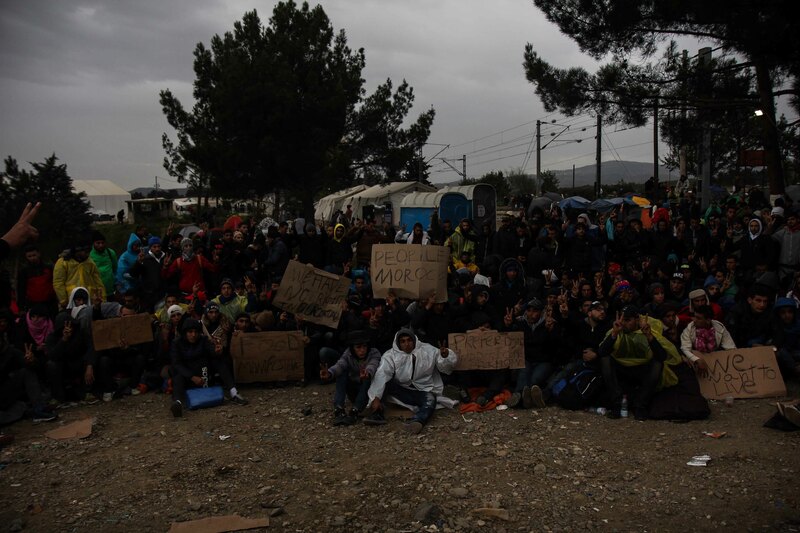 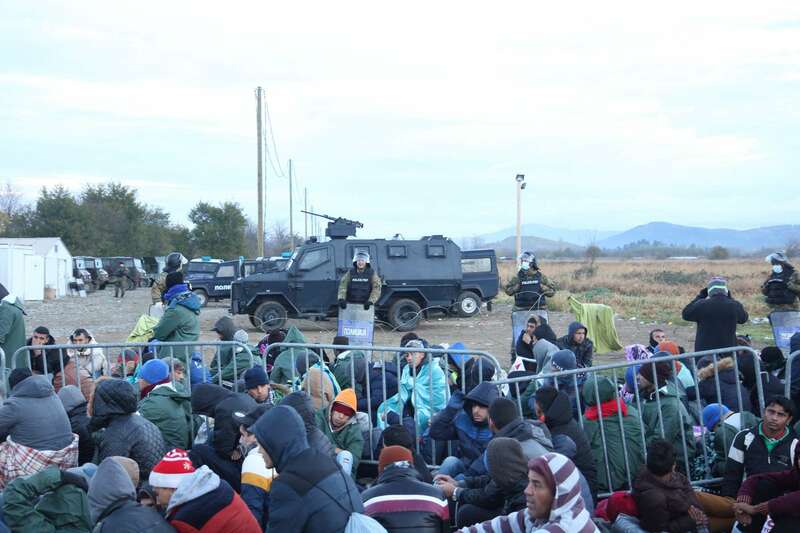 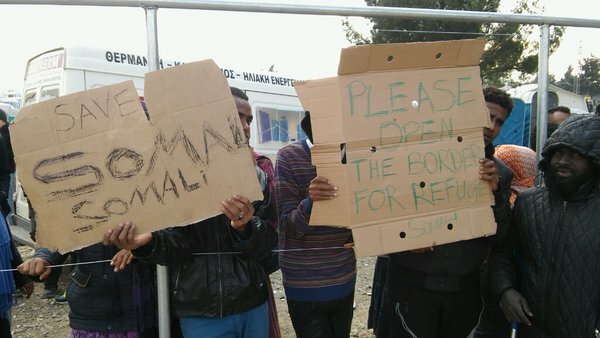 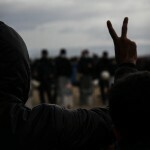 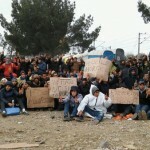 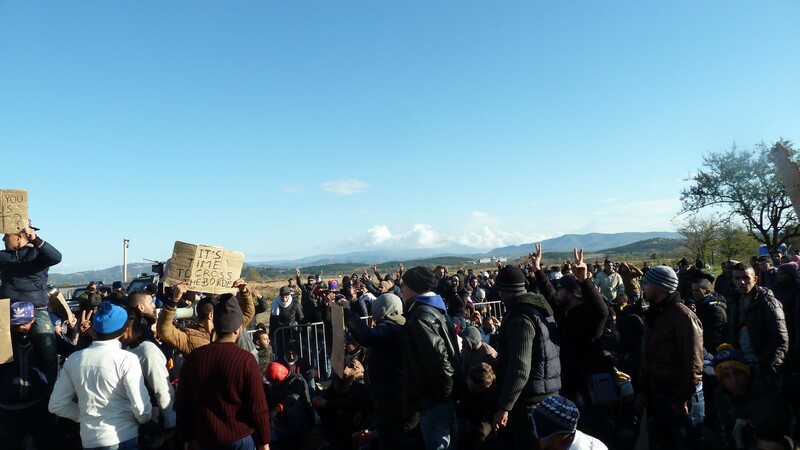 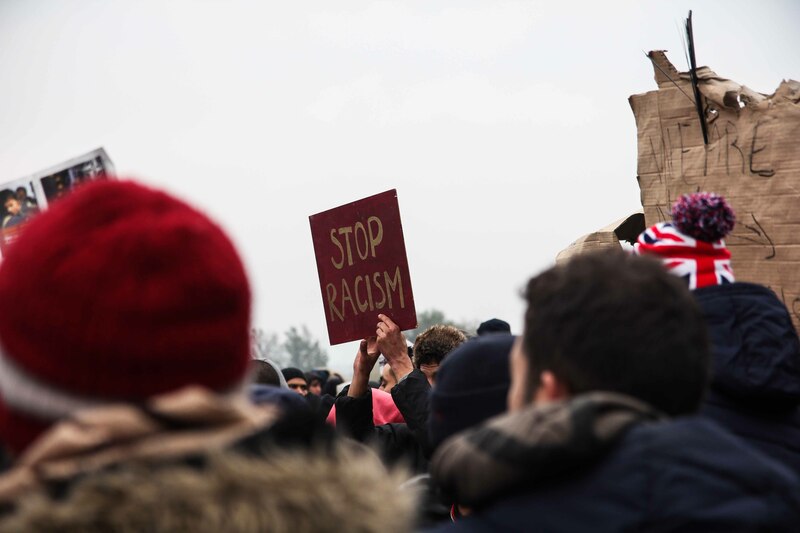 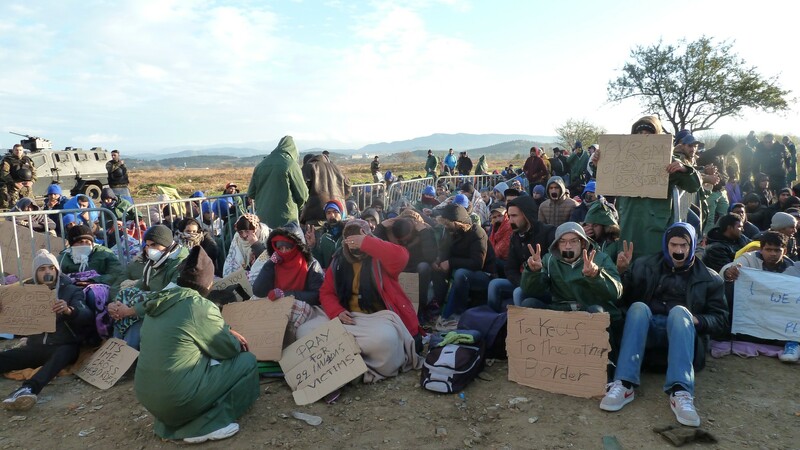 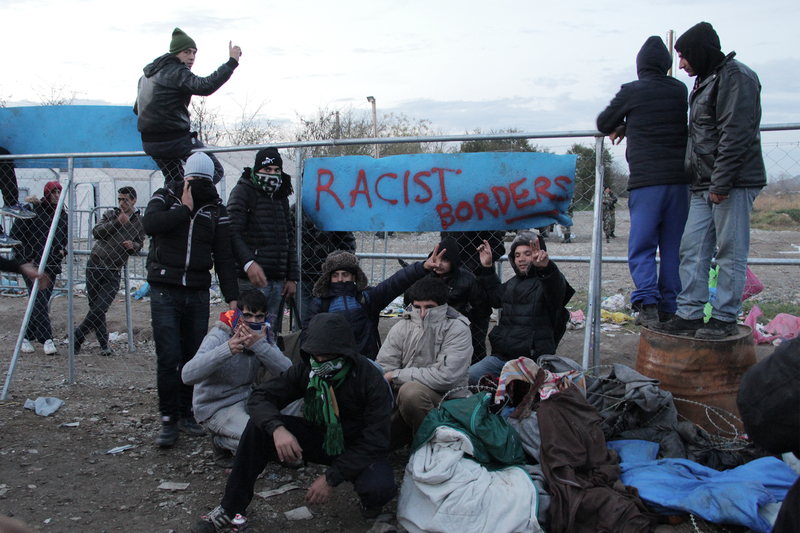 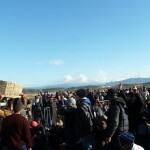 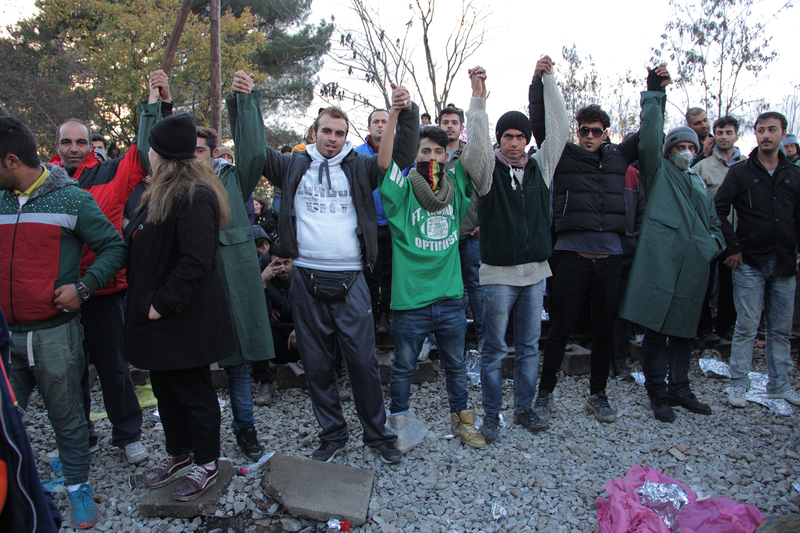 Solidarity with the protests in Eidomeni! 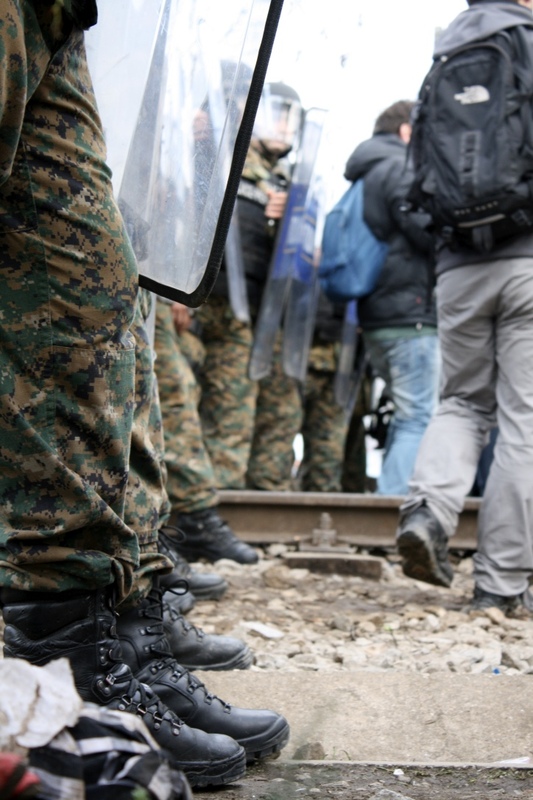 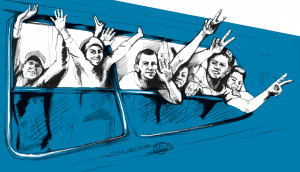 Freedom of movement through the Balkans for all! 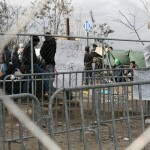 Last Friday the government of Slovenia started to refuse border crossings and the transfer of all refugees and migrants, who cannot prove to come from Syria, Irak and Afghanistan. 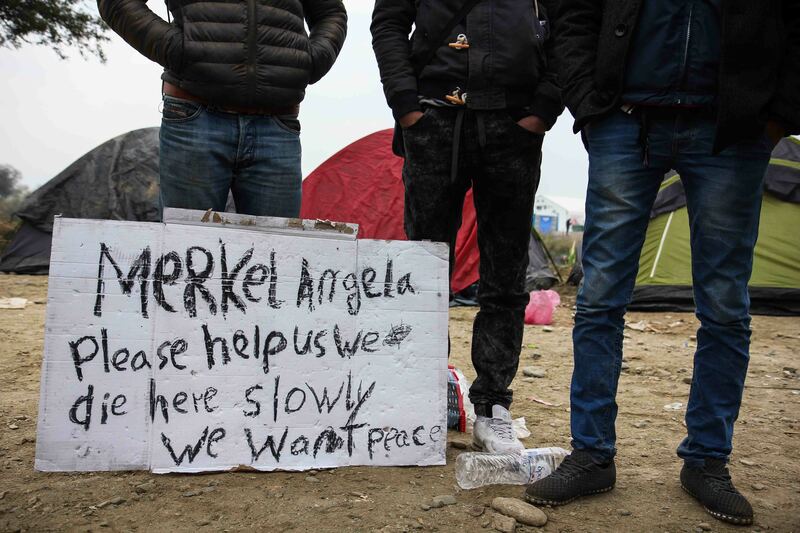 Hardly to imagine that the Austrian and German ministers did not agree or not even inspire to do such a new massive attack on the refugee movement through the Balkans. 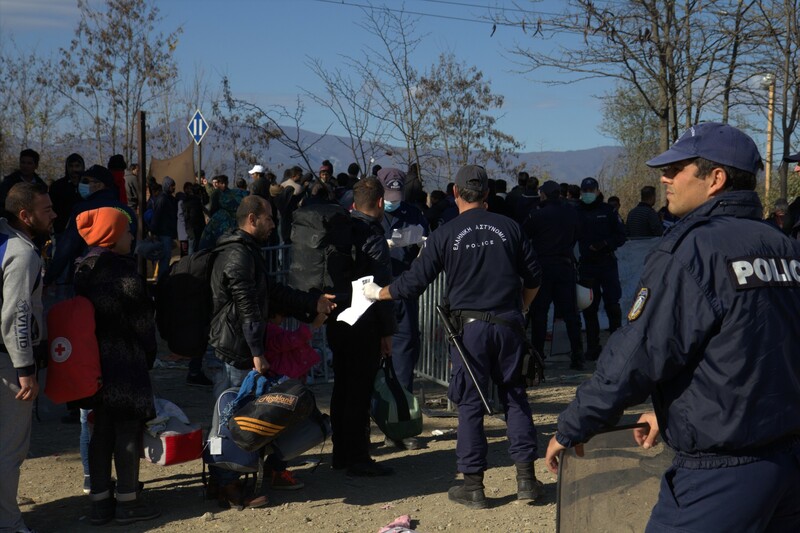 And as expected the governments of Croatia, Serbia and Macedonia followed this new policy of selection and closed the borders for the filtered groups as well. 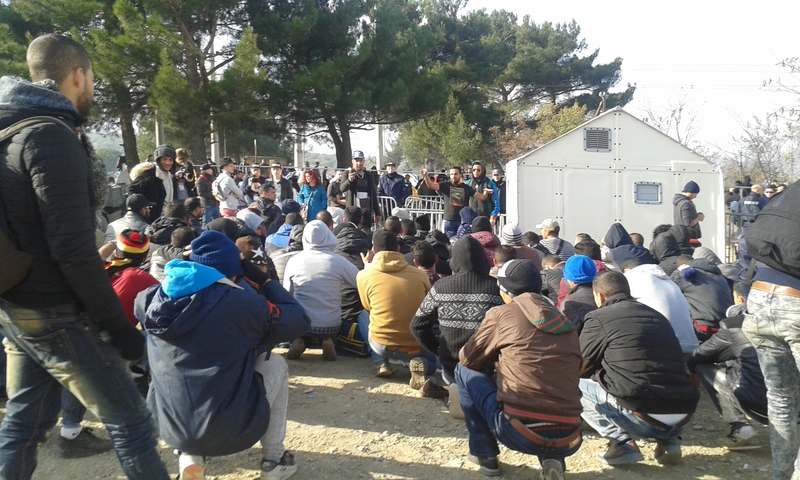 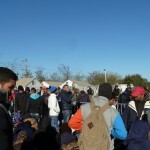 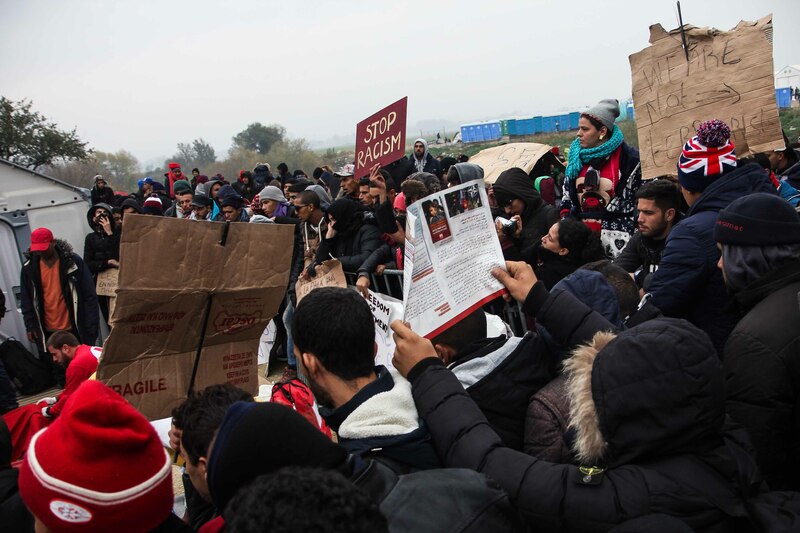 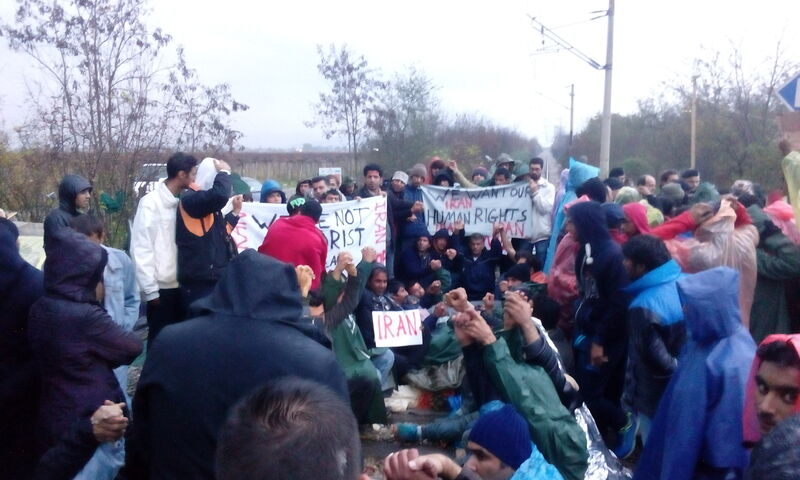 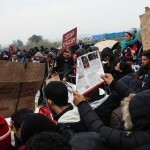 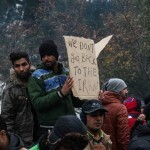 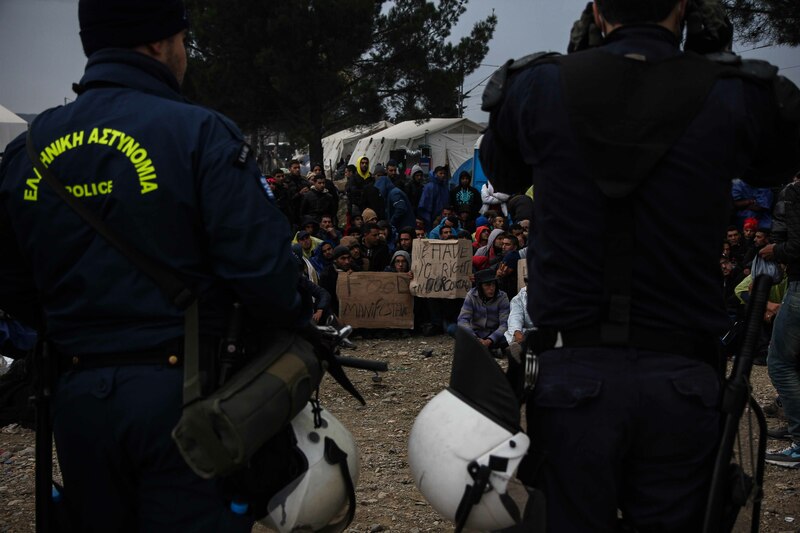 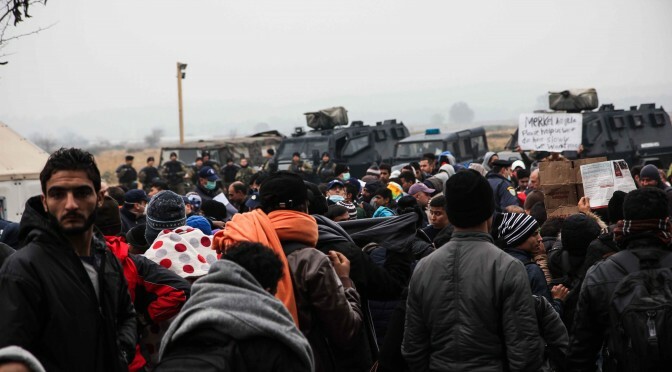 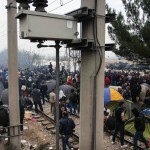 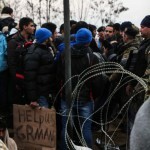 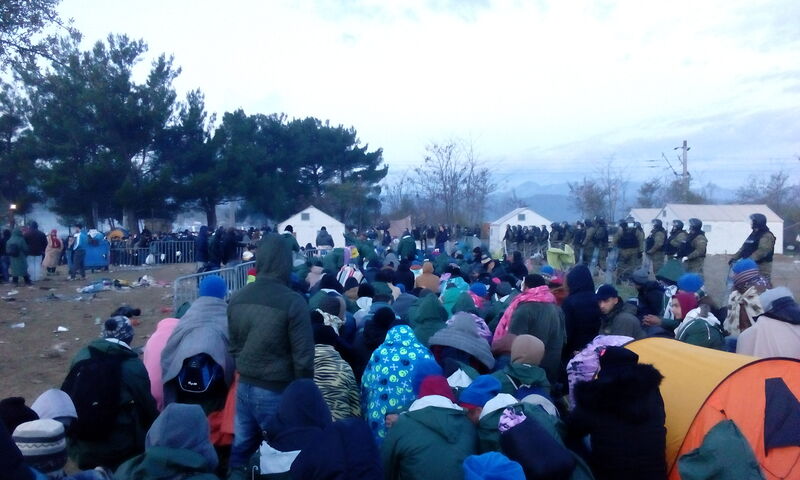 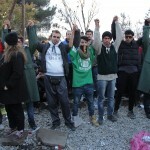 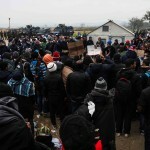 Now thousands of refugees and migrants mainly from Iran, Pakistan, Bangladesh and Morocco are blocked near Eidomeni at the greek-macedonian border, but they immediately started with protests, blockades and hunger strikes. 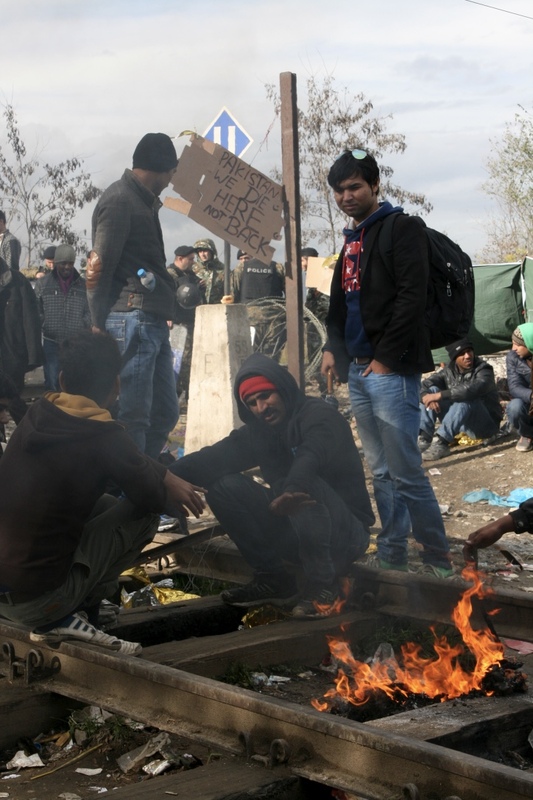 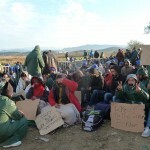 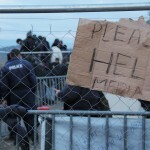 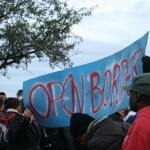 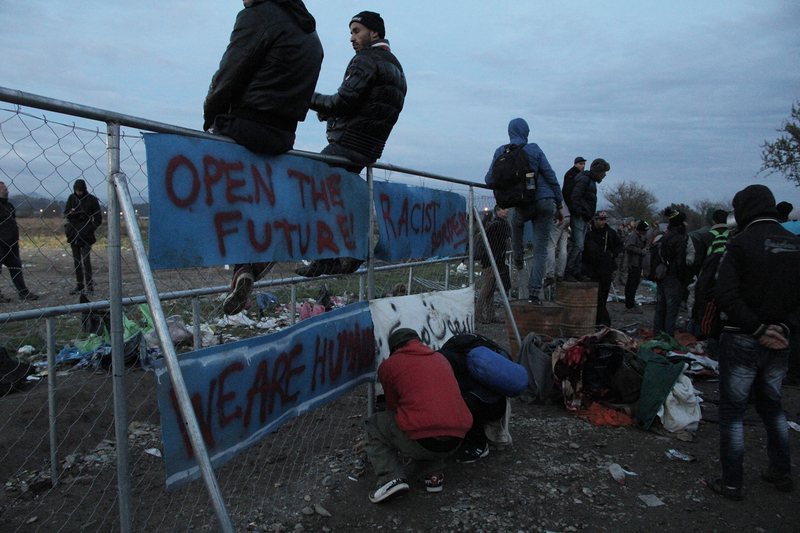 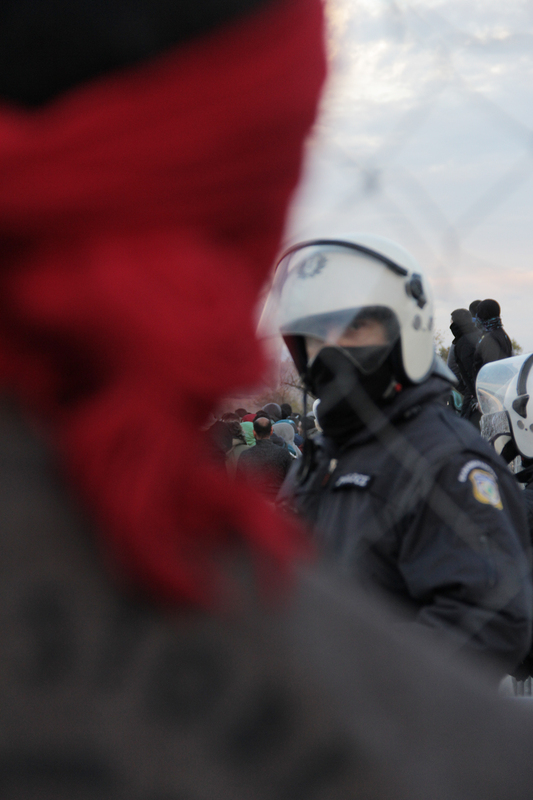 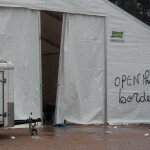 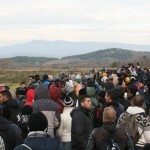 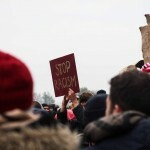 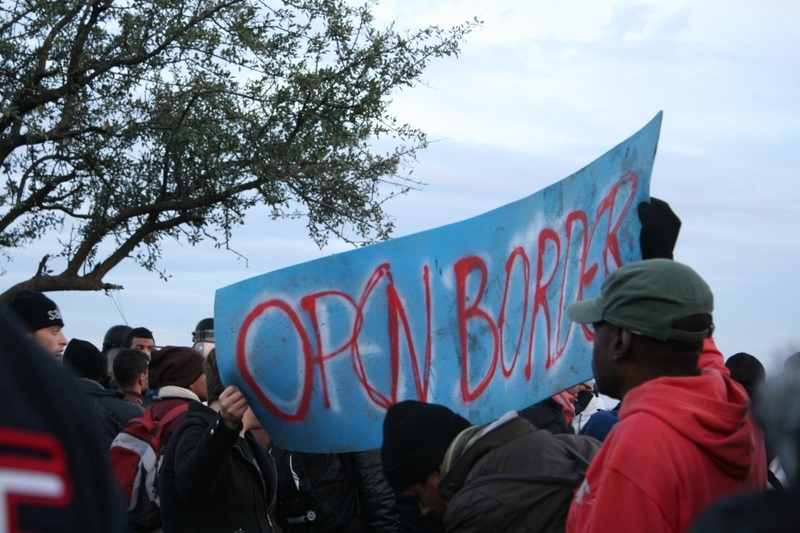 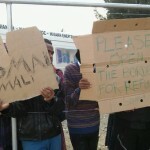 21.40: Melting Pot Europa: Call to open the borders along the Balkan route countries now! 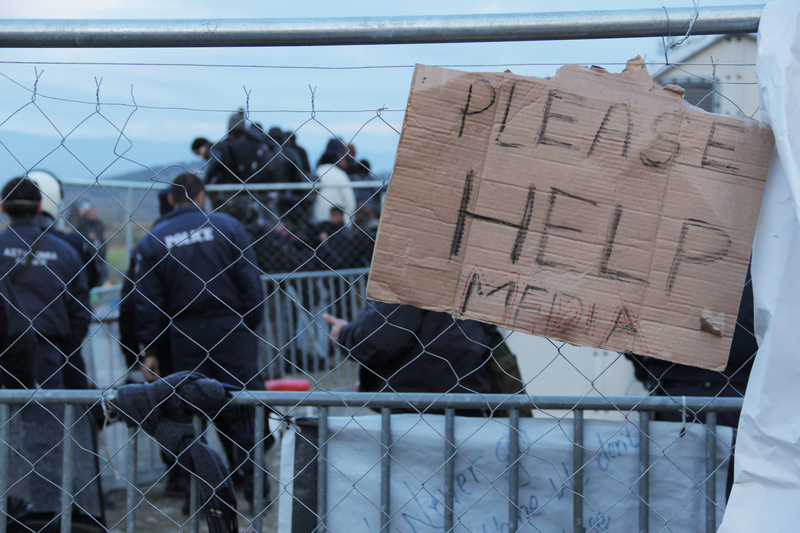 21.30: We will continue to report live tomorrow. 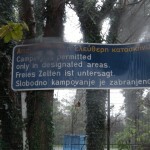 17.15: Situation unchanged so far. 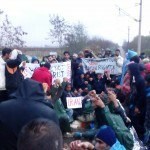 Bangladeshi and Iranian protest groups are sitting together on the train tracks. 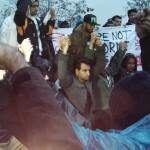 13.30: Article & Video about yesterday’s protest by The Guardian. 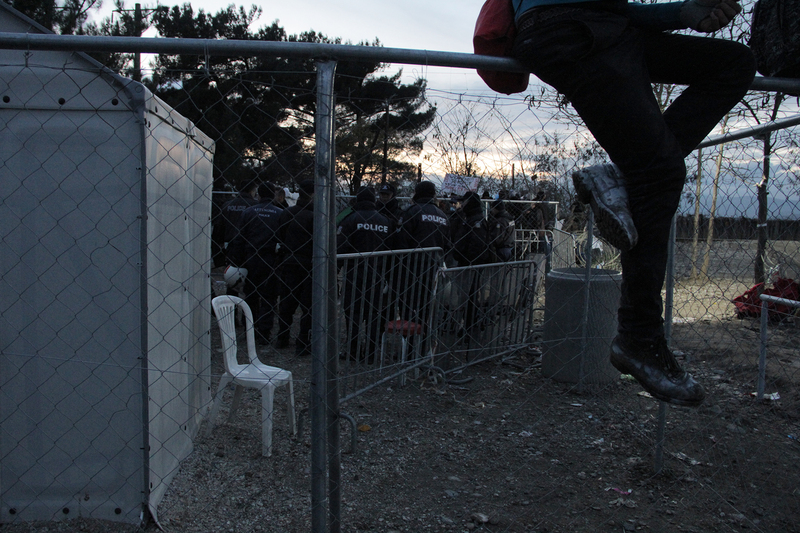 19.00: We left the area and will come back tomorrow. 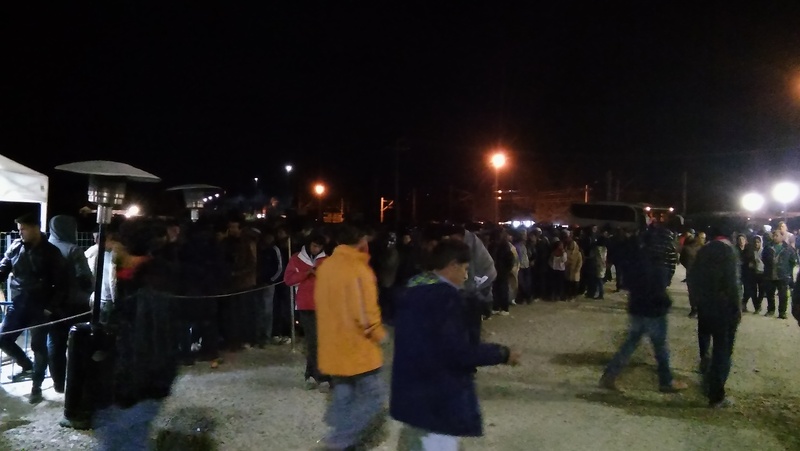 18.30 : People are queuing up for food. 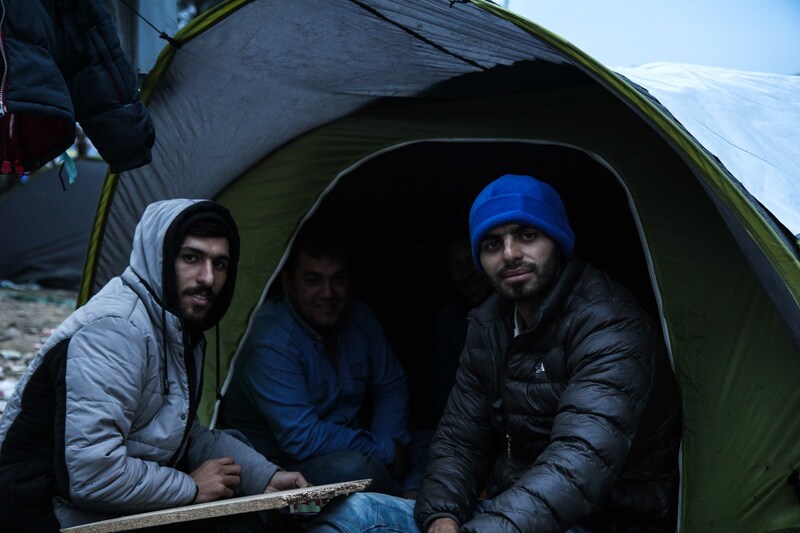 There are no warm meals provided. 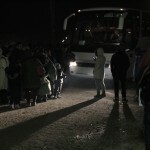 18.15: Recently, some buses arrived. 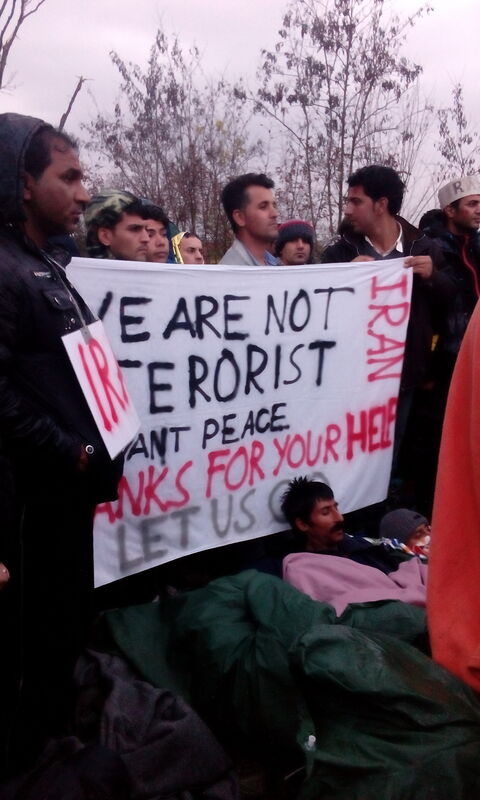 In the buses were Syrians, Afghanis and Iraqis as well as people, who are not from these countries. 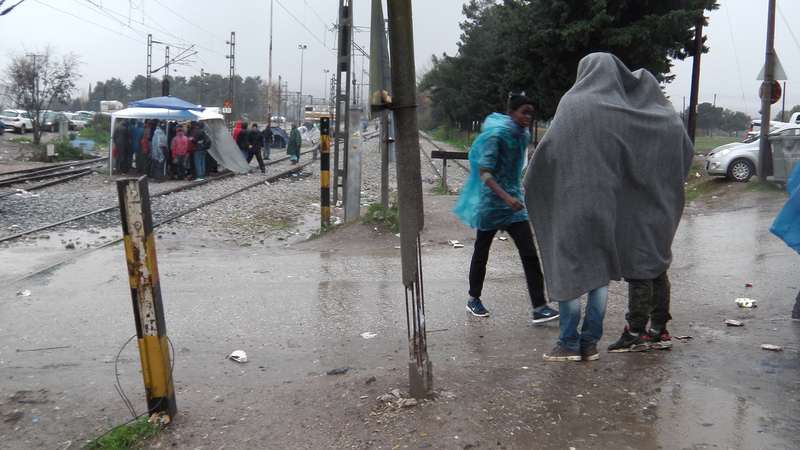 We received information, that yesterday two buses with people not allowed to cross the border, mainly families, went back to Athens. 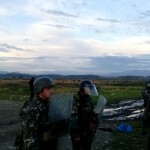 15.30: After the tense situation in the morning, everything calmed down. 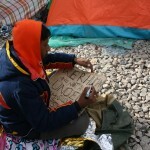 Some protesters still remain in a kind of sit-down strike – without shirts and with sew up lips. 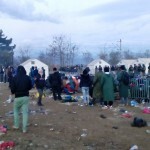 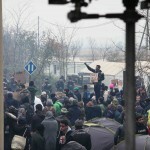 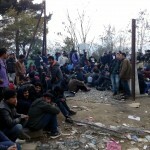 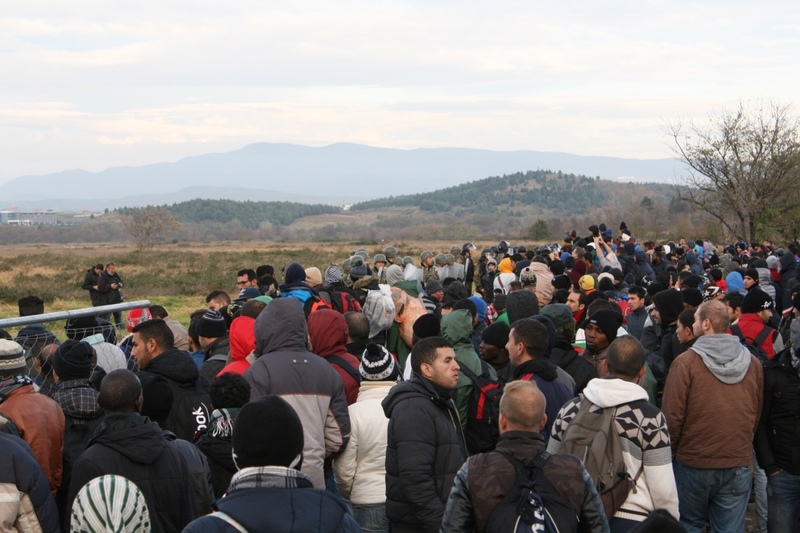 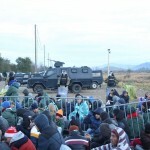 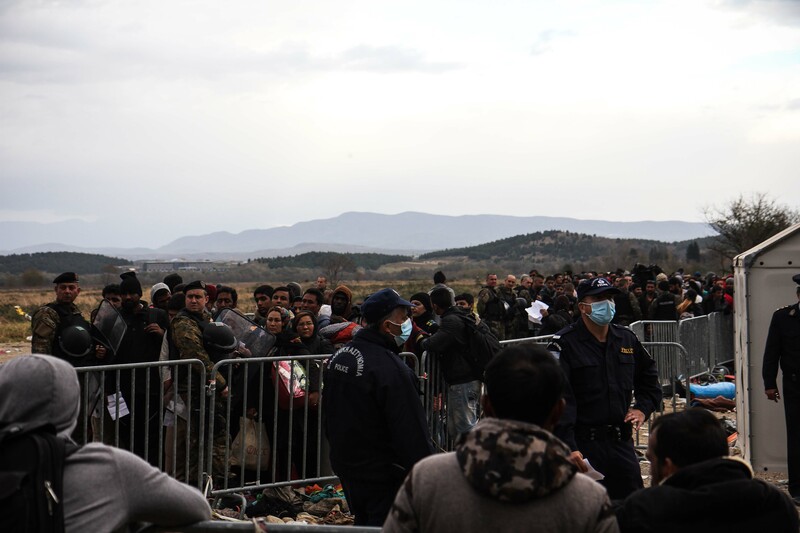 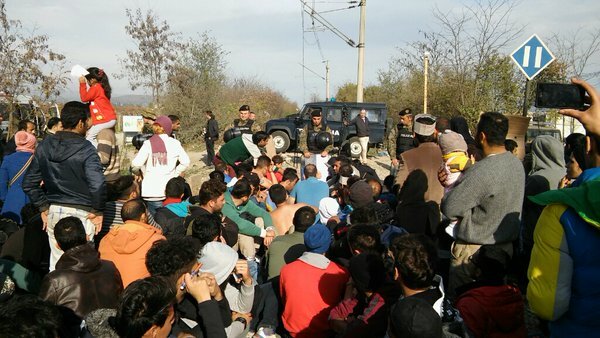 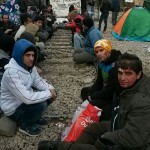 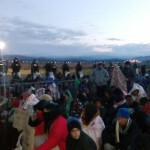 11.20: Some Afghans were denied entry to Macedonia. 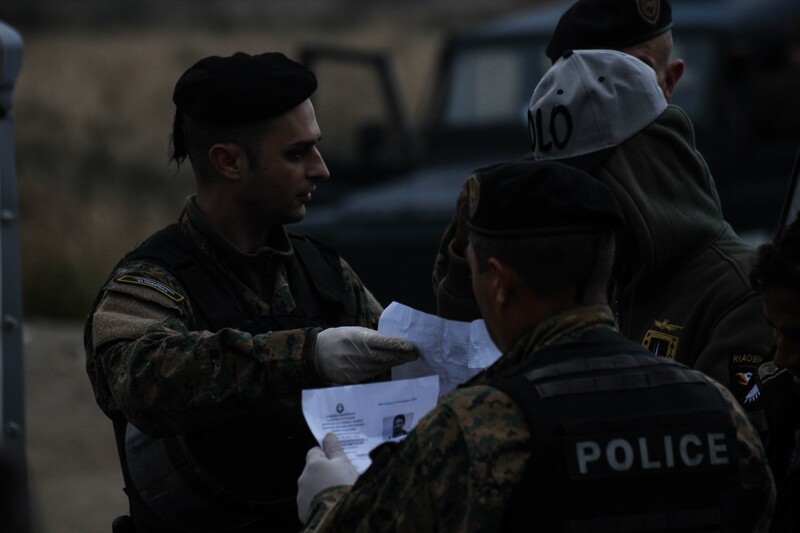 Explanation to them by the police: Faked registration papers. 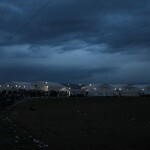 11.05: People start to sew up their mouths. 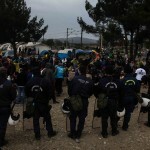 09.20: There are two protesting groups now. 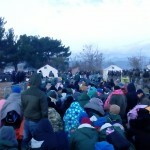 Videos here and here. 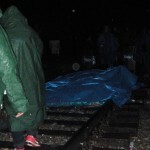 In front of our eyes, someone collapsed. 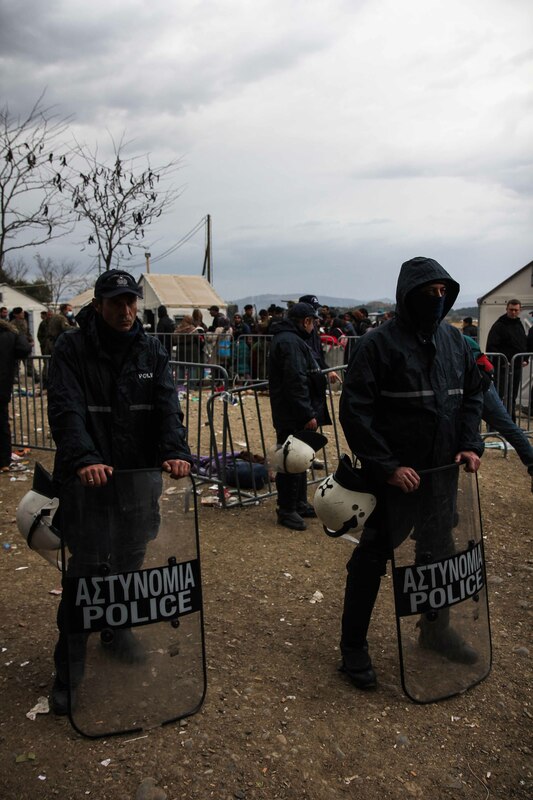 We asked the police to call a doctor. 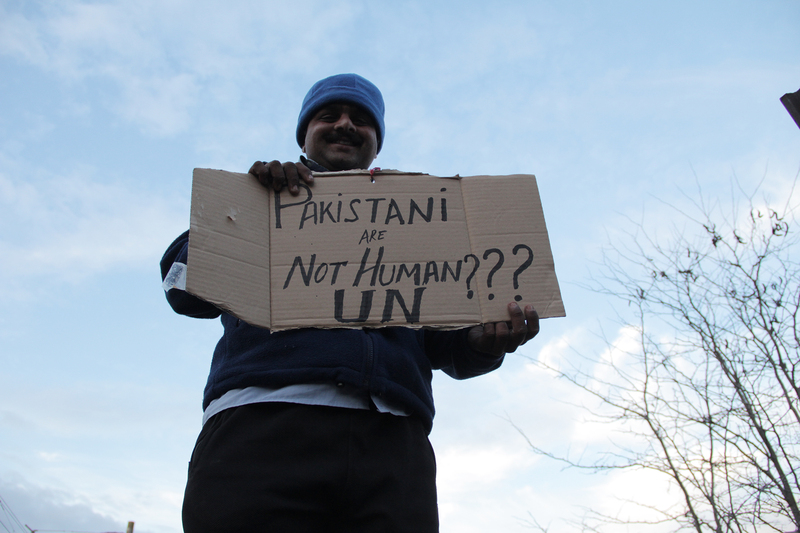 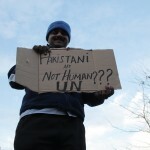 Their answer: „The UN should take care about this“. 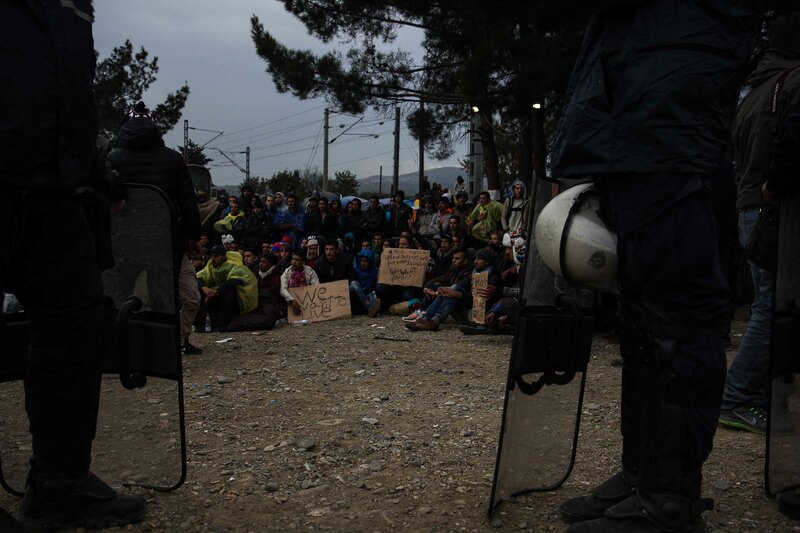 07.10: UNHCR-staff talked to the protesters in Arabic and asked them to go back to Athens. 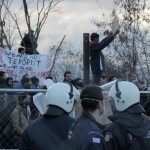 They refused: „We will cross, or die“. 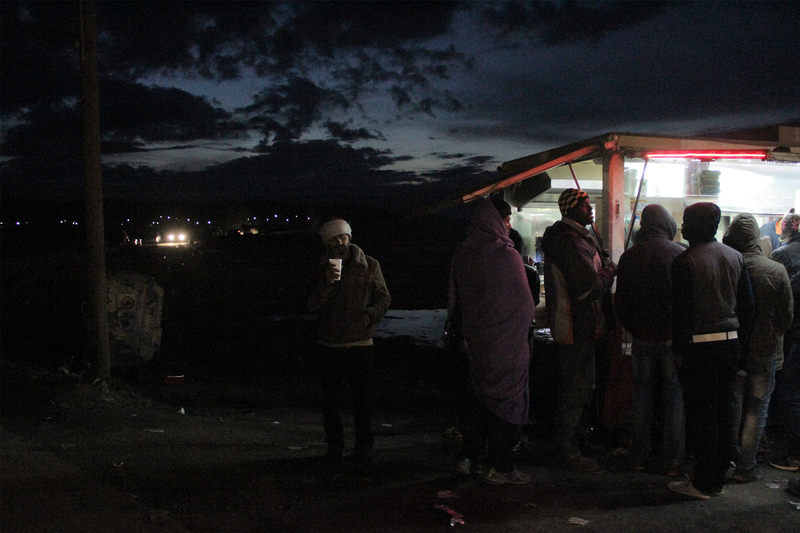 06.50: We just talked to some Moroccans. 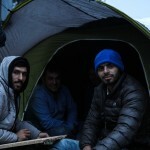 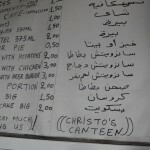 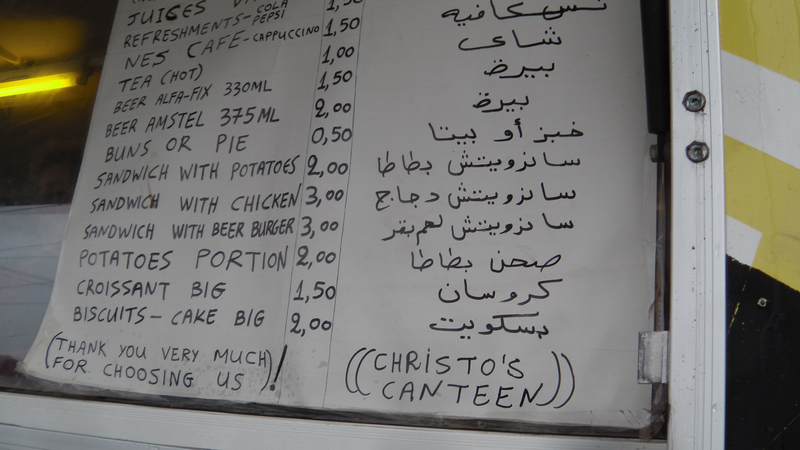 They told us, that they sold everything at home for doing this trip. 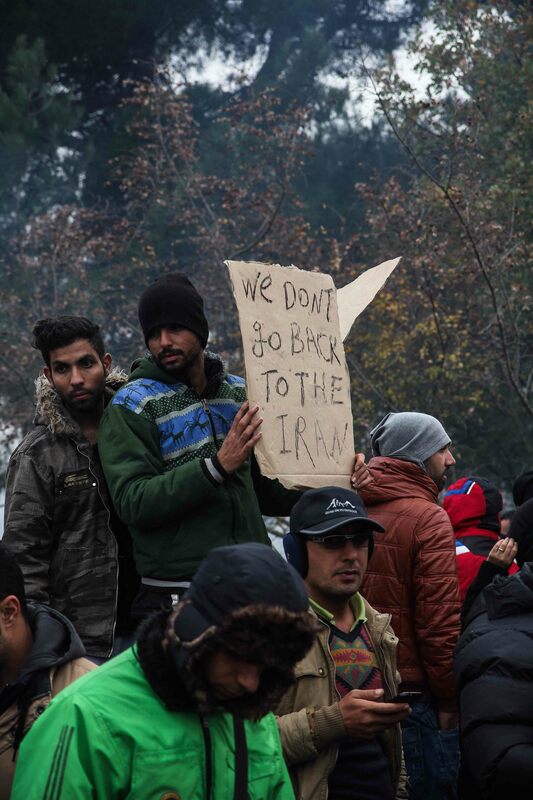 So they can’t and will not go back. 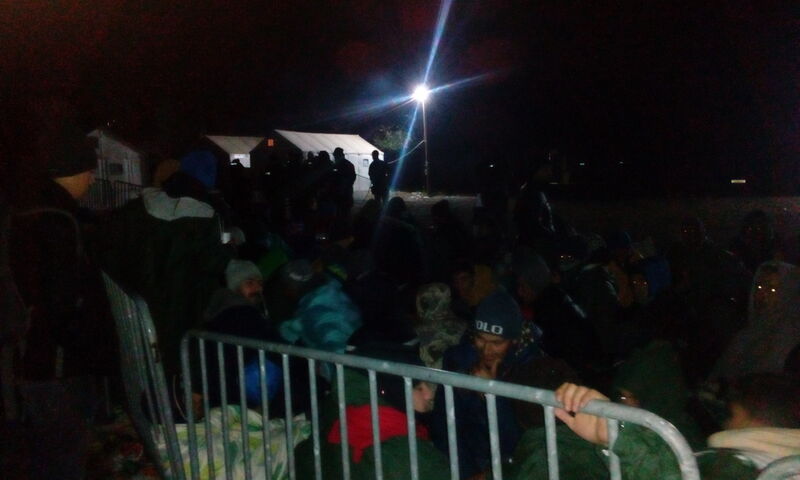 06:00: Only 10 meters away from the sitting refugees, other refugees are waving with their papers allowing them to cross the border and are let trough one after the other. 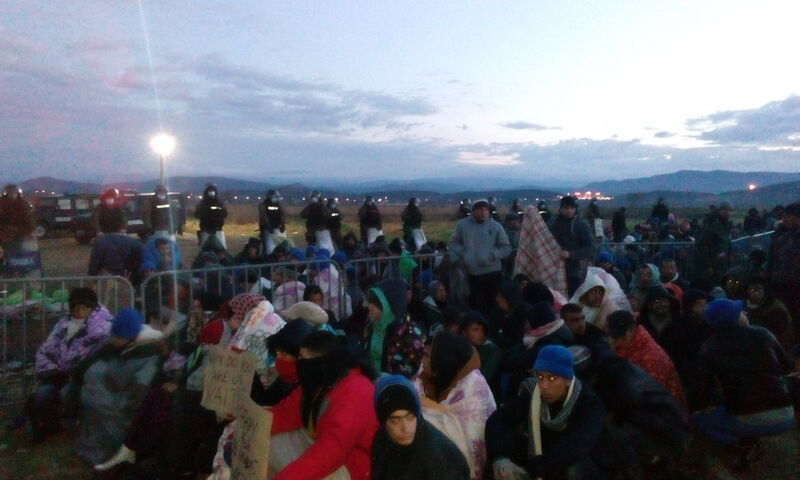 05.35: A group of refugees allowed to cross the border just arrived beside the protesters. 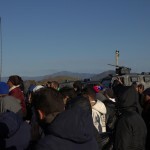 05.10: Approximately 250 people are shouting slogans at the border crossing point. 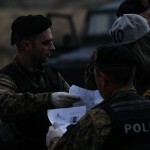 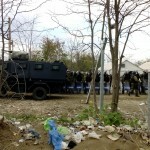 Only four Greek policemen are present at the moment, surrounded by about 15 Macedonian soldiers. 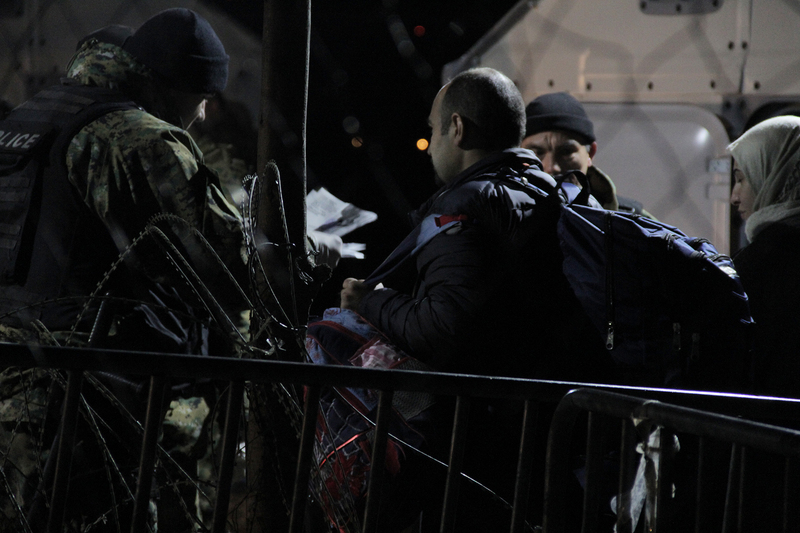 18.40: We just left the border area. 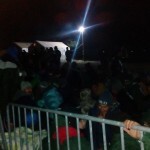 Before, we talked to some people who told us, that they have already been waiting between two and five days. 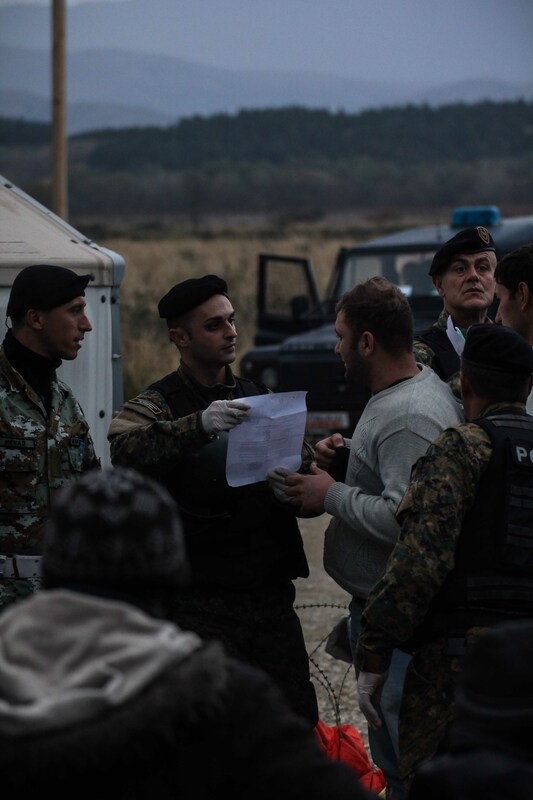 Furthermore, we learnt, that for passing the border, the nationality written down on the official Greek registration papers is relevant. 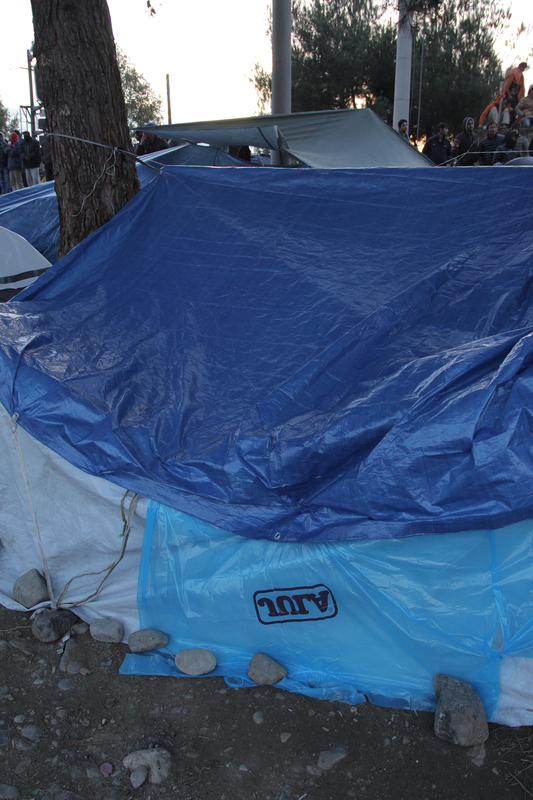 We will continue to report tomorrow morning. 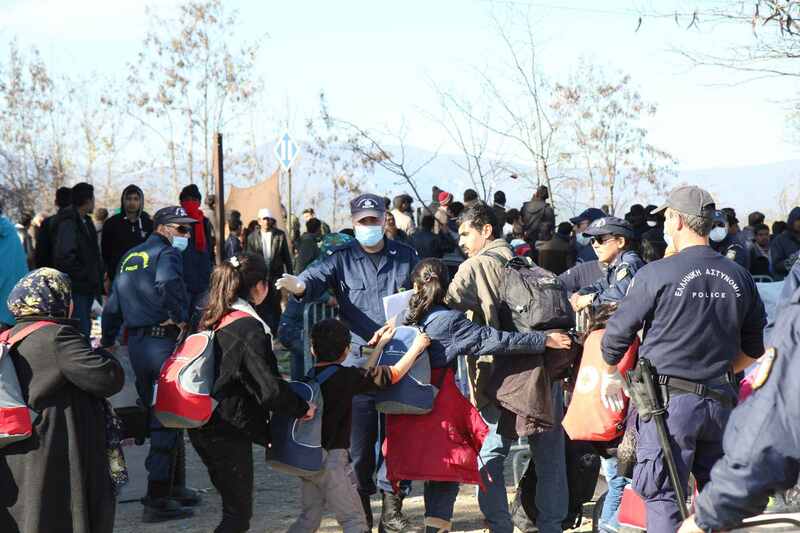 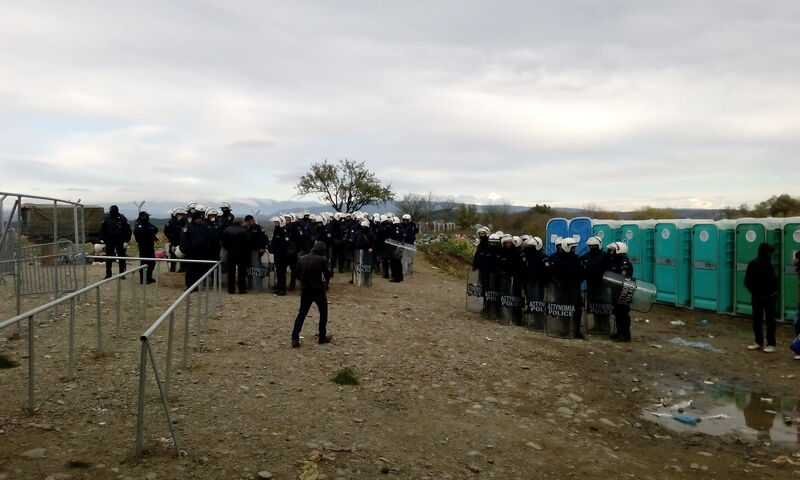 17.50: The border is blocked for people with „wrong documents“ not only by Macedonian army, Greek police is also actively involved in the segregation. 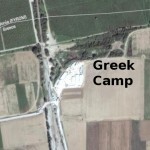 This means, Alexis Tsipras agreed with it. 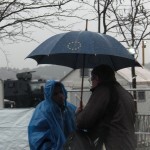 17.20: Protests calmed down, rain becomes stronger. 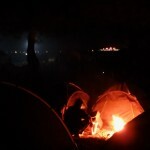 Everywhere small campfires. 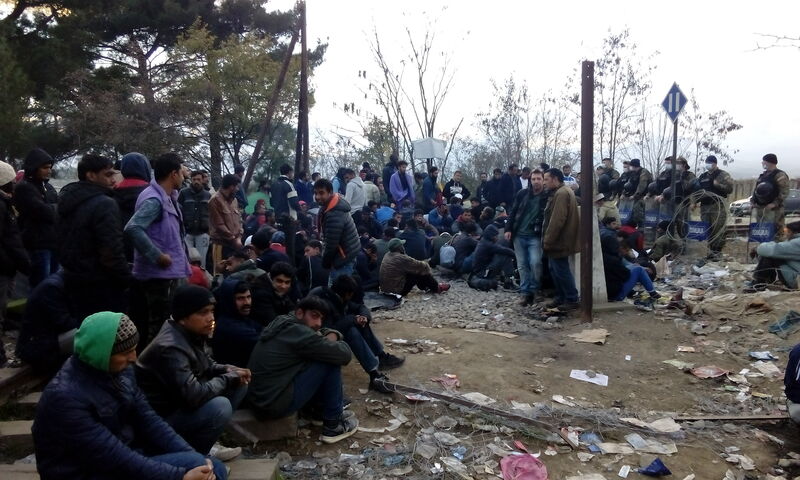 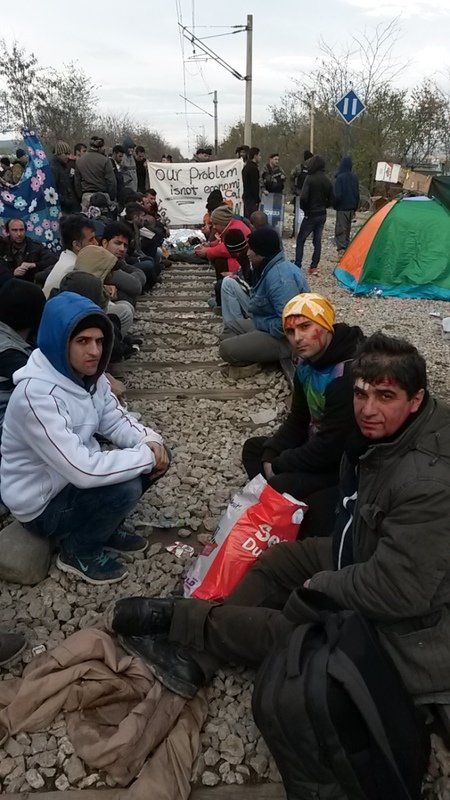 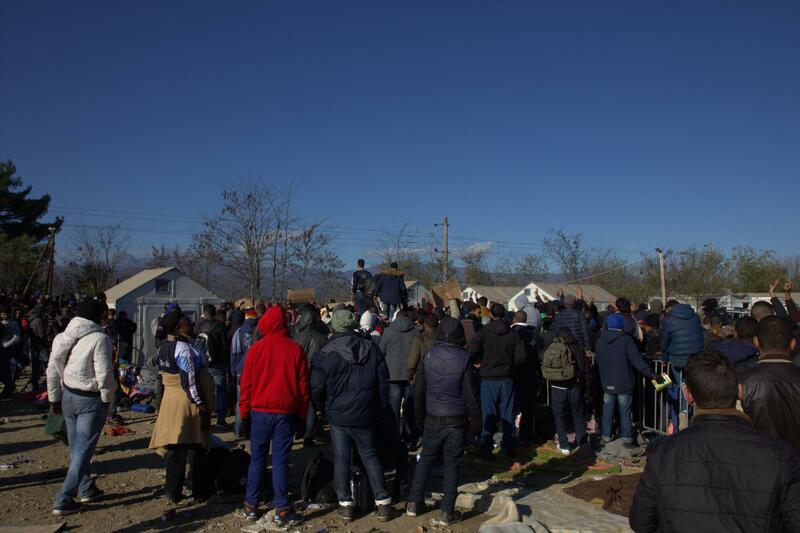 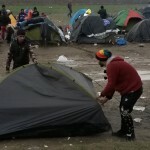 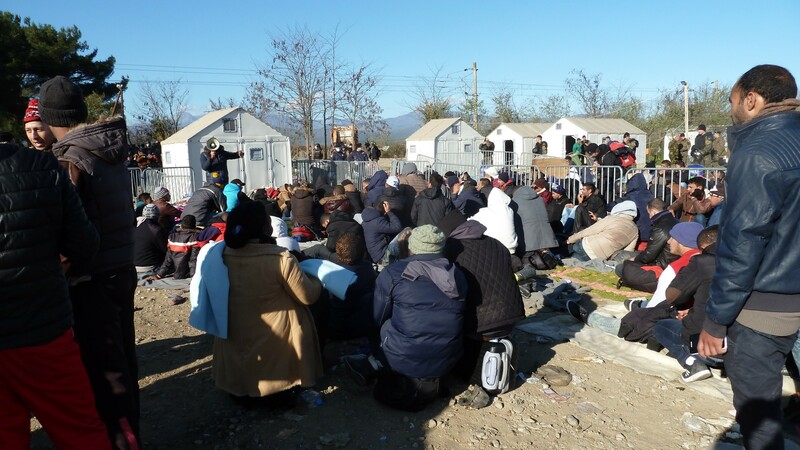 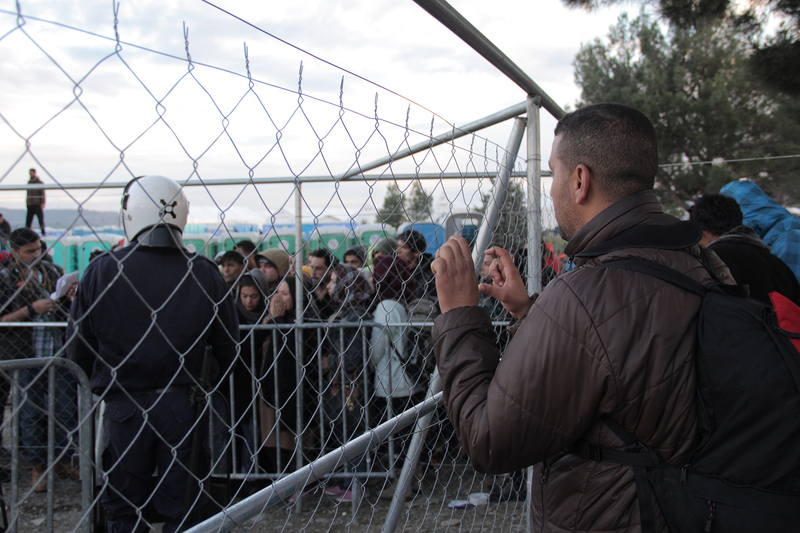 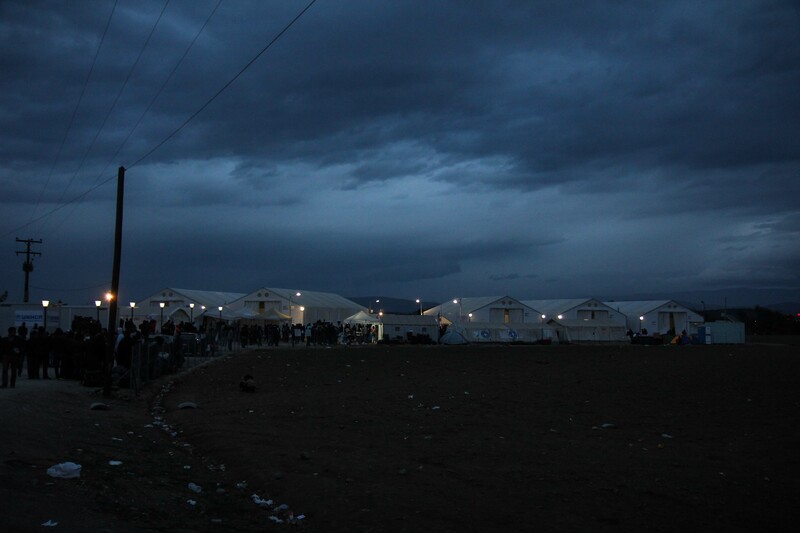 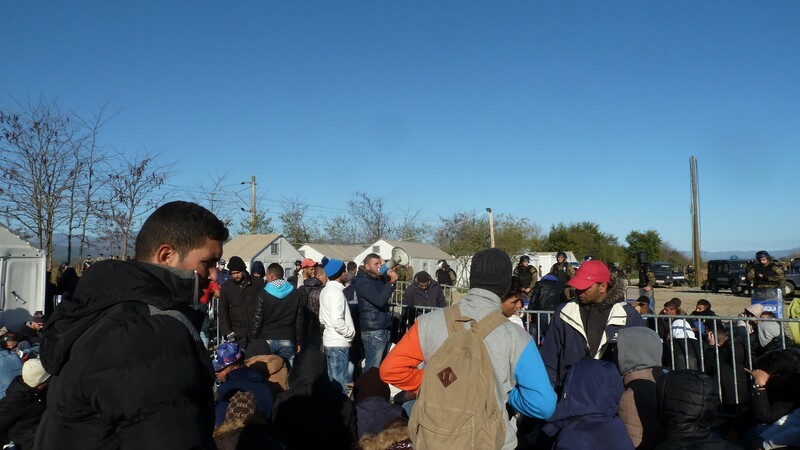 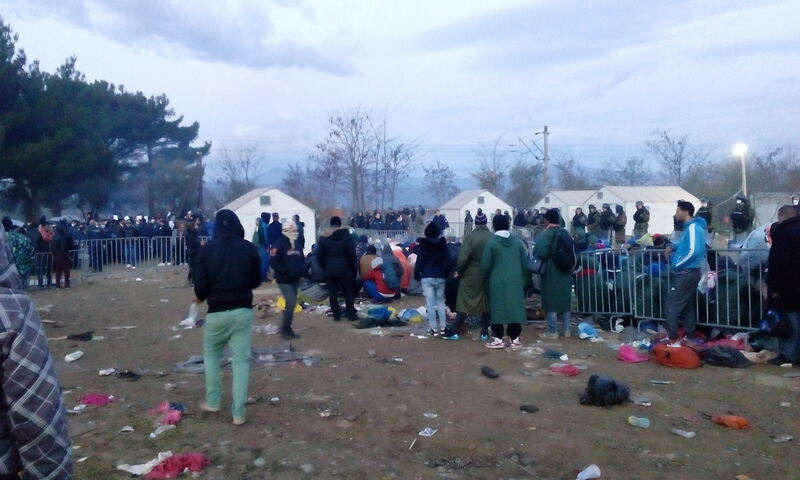 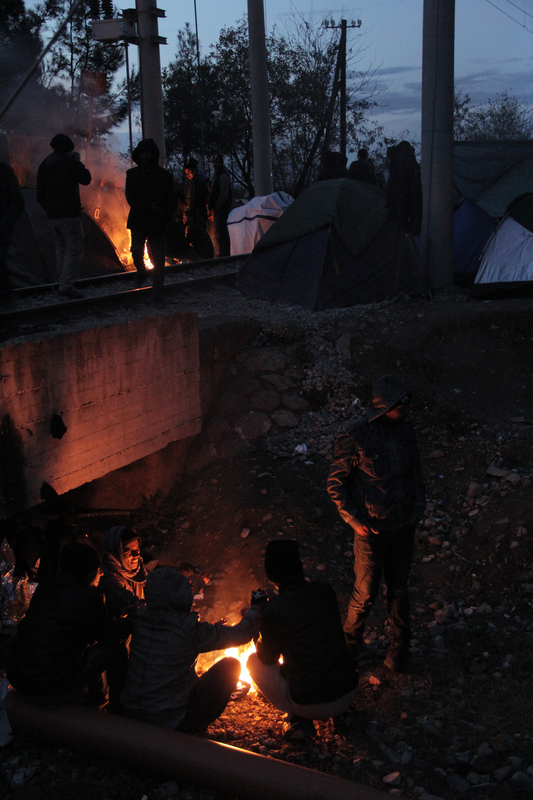 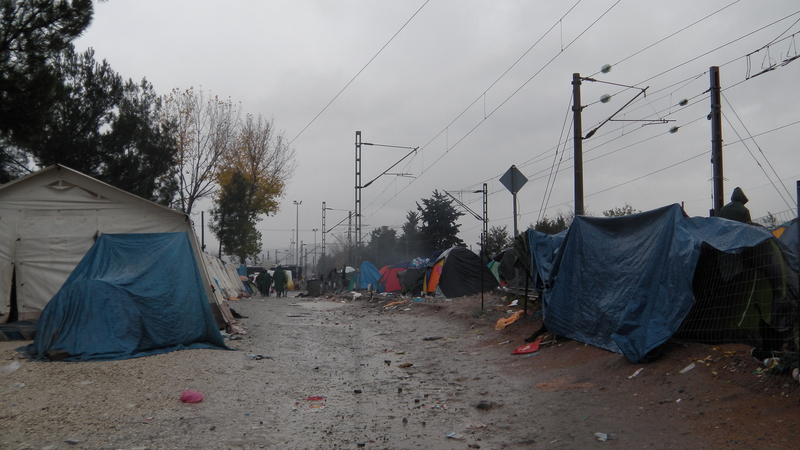 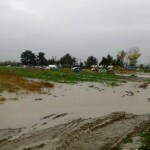 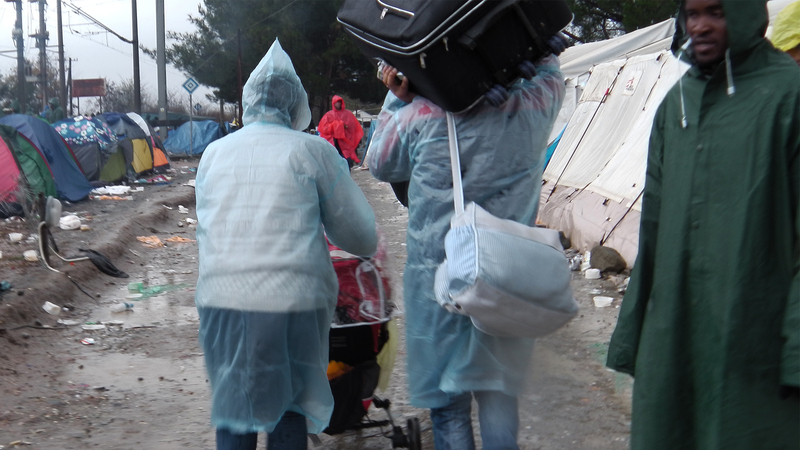 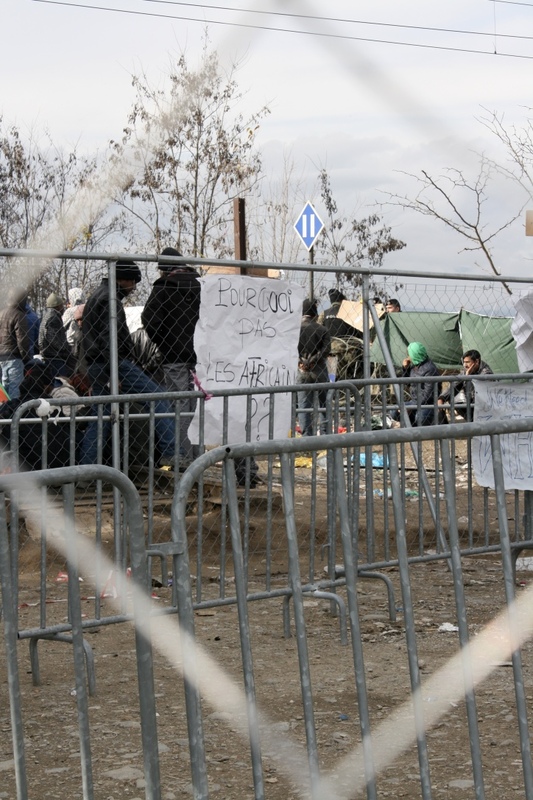 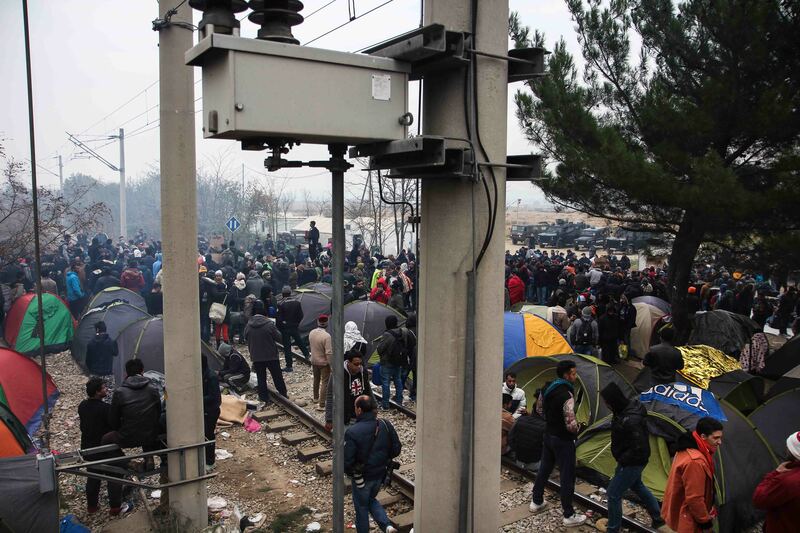 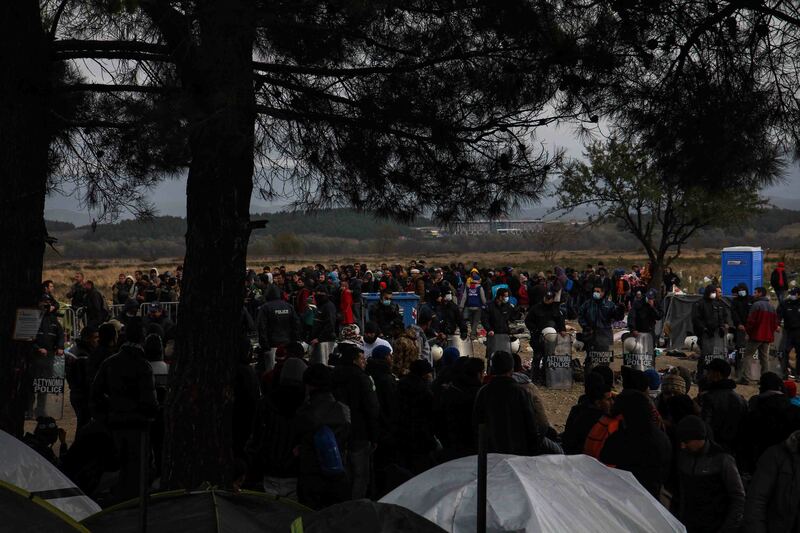 According to MSF, approximately 2.500 people are stuck in Eidomeni. 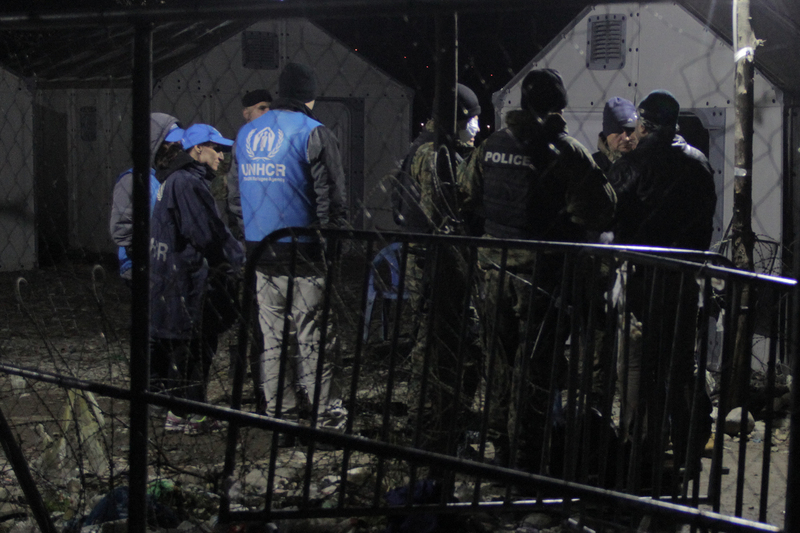 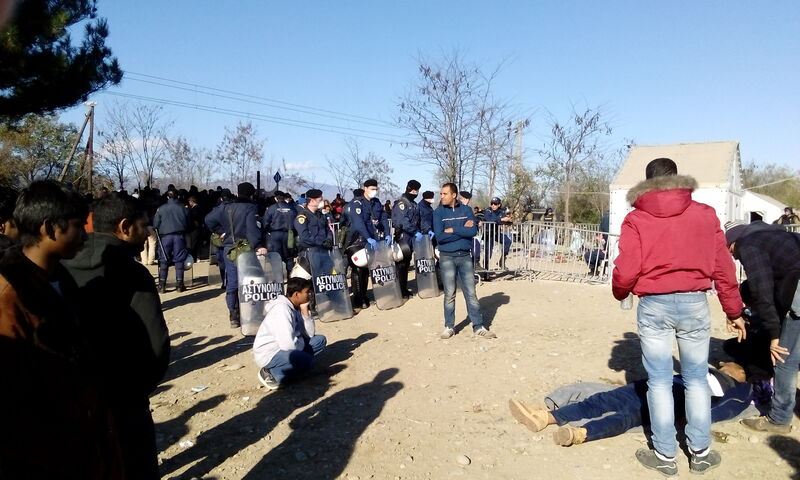 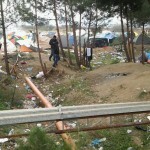 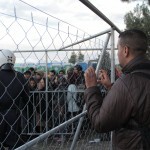 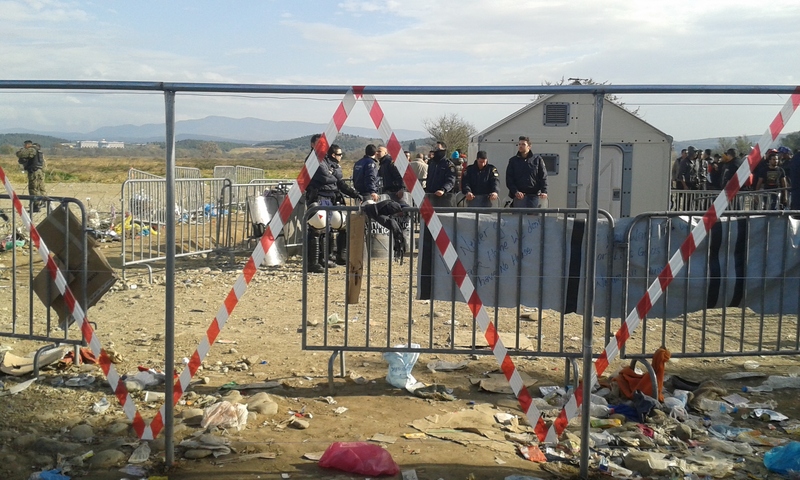 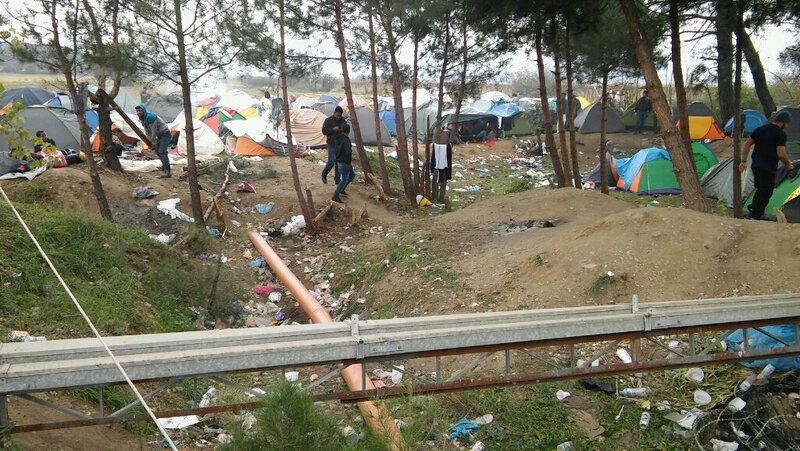 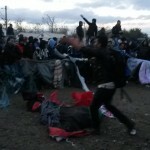 15.30: One refugee injured himself in front of the Macedonian police line. 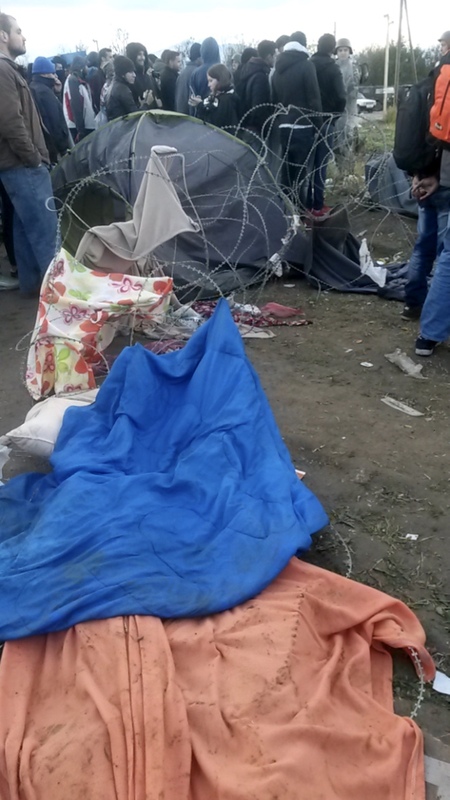 He had a head laceration and was taken away. 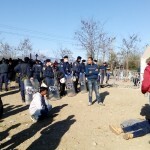 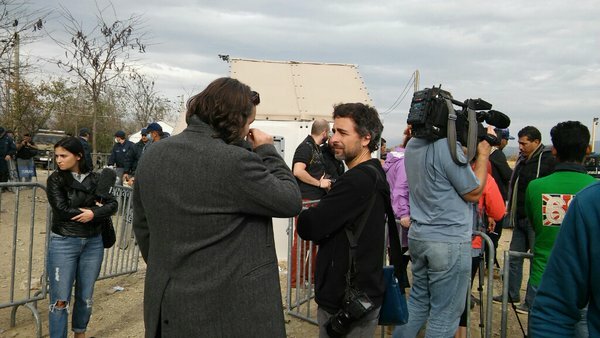 15.00: About 400 people, who are not allowed to cross the border, are standing directly in front of it. 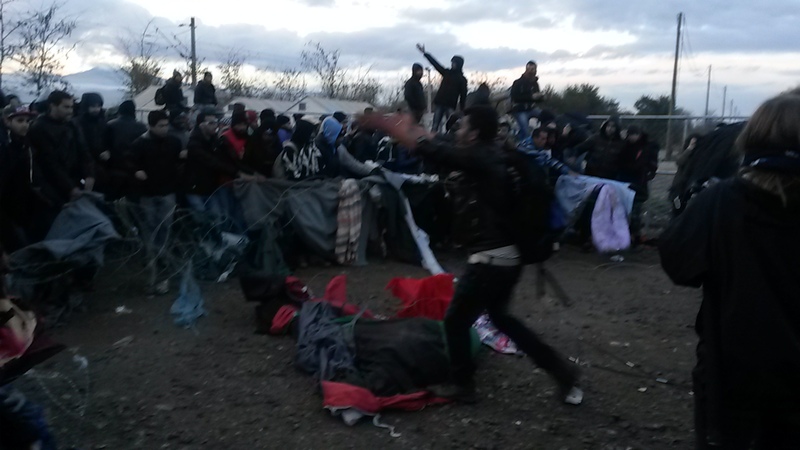 They are shouting slogans. 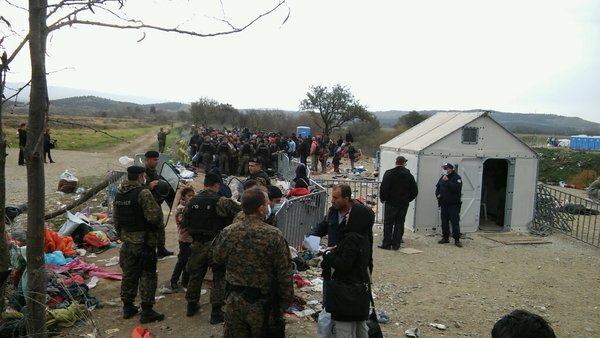 They were just passed by a group of people, who were allowed to enter Macedonia. 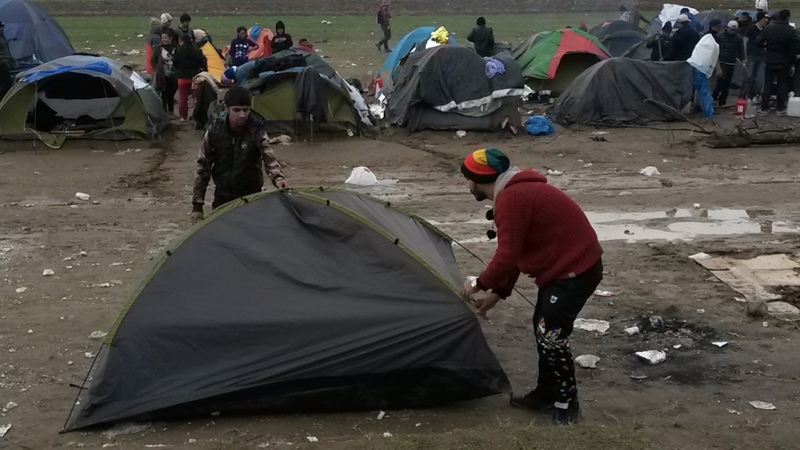 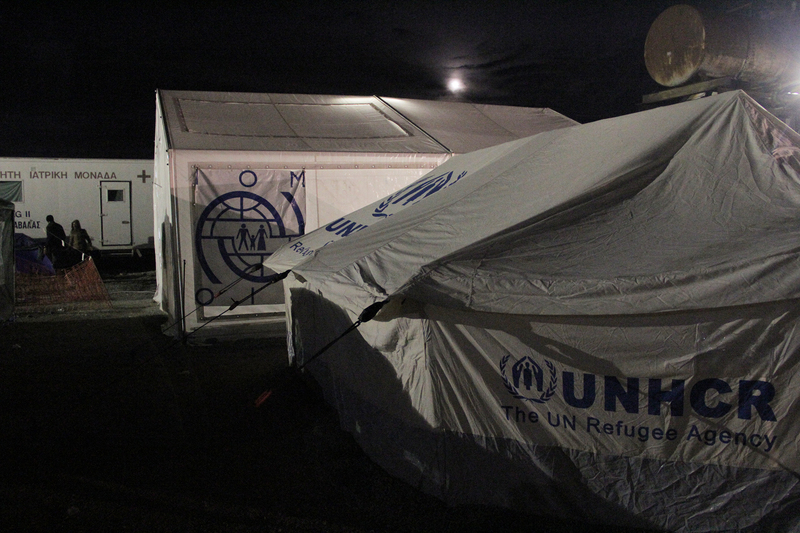 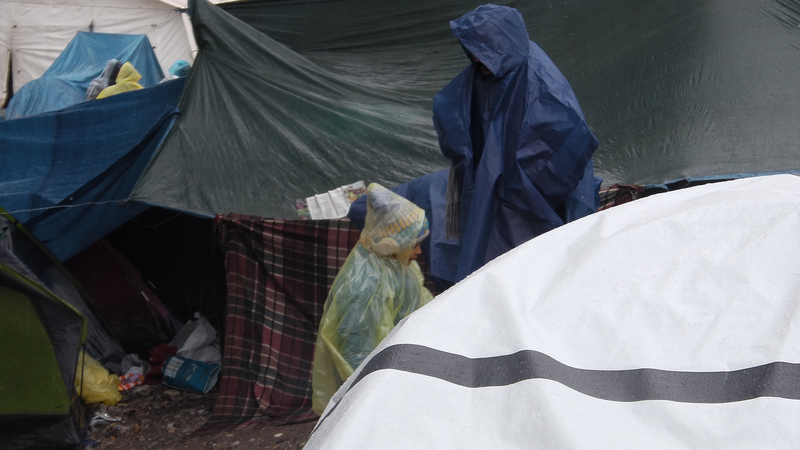 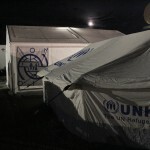 Due to the bad weather, the majority of the stuck refugees is in tents at the moment: There are about 150 small tents and some bigger ones, built up by organisations. 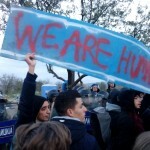 One group started a hunger strike.